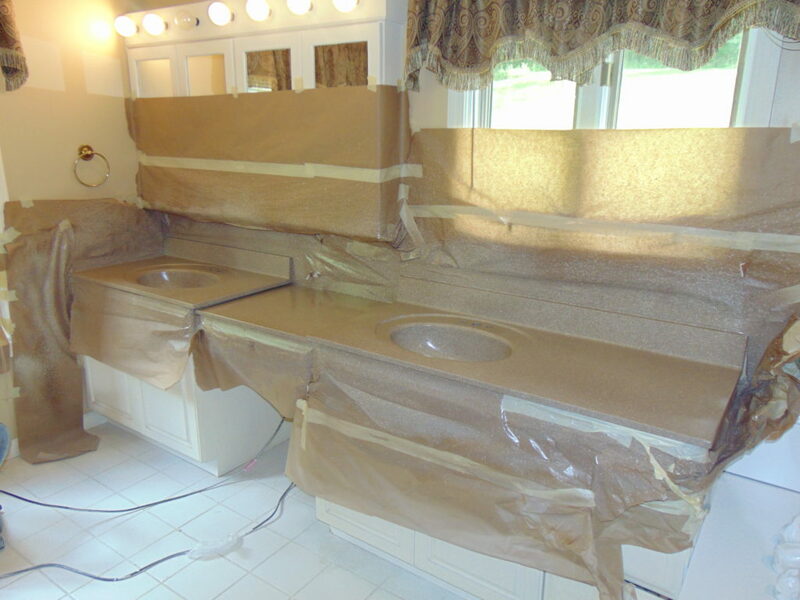 Need inspiration for your surface refinishing project? 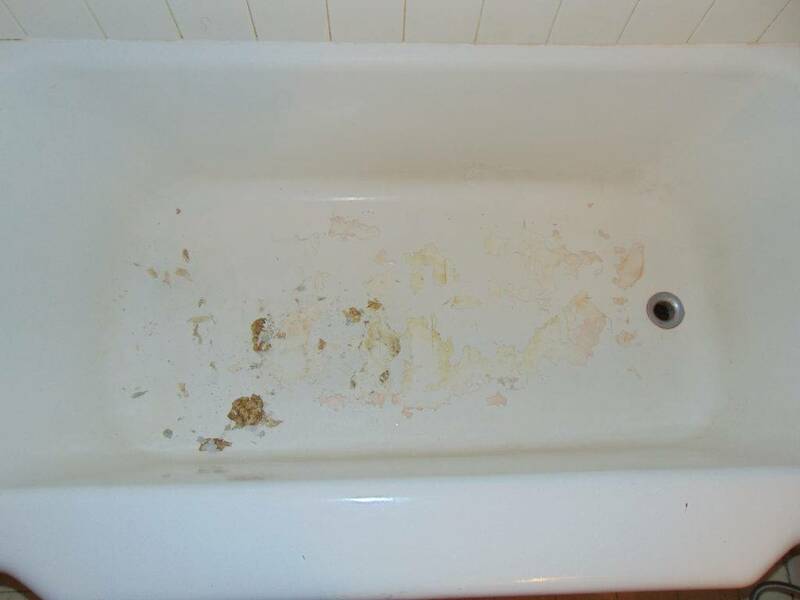 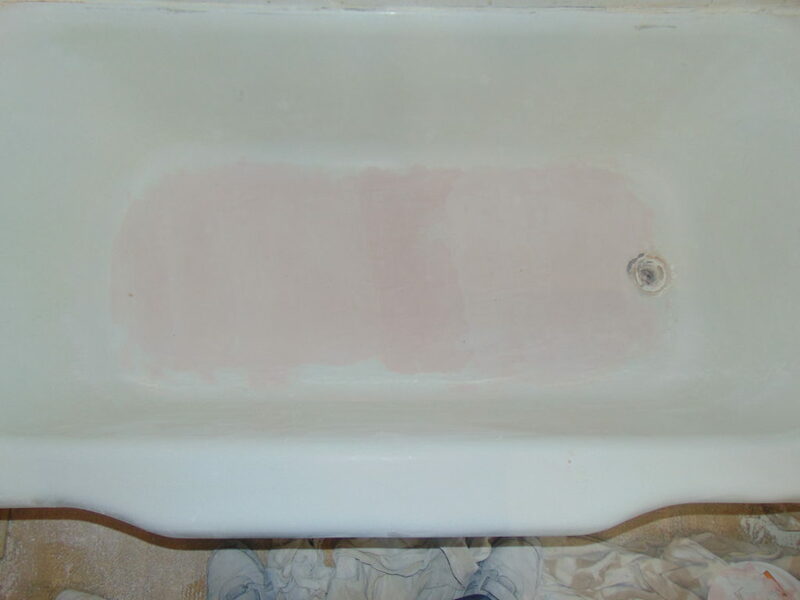 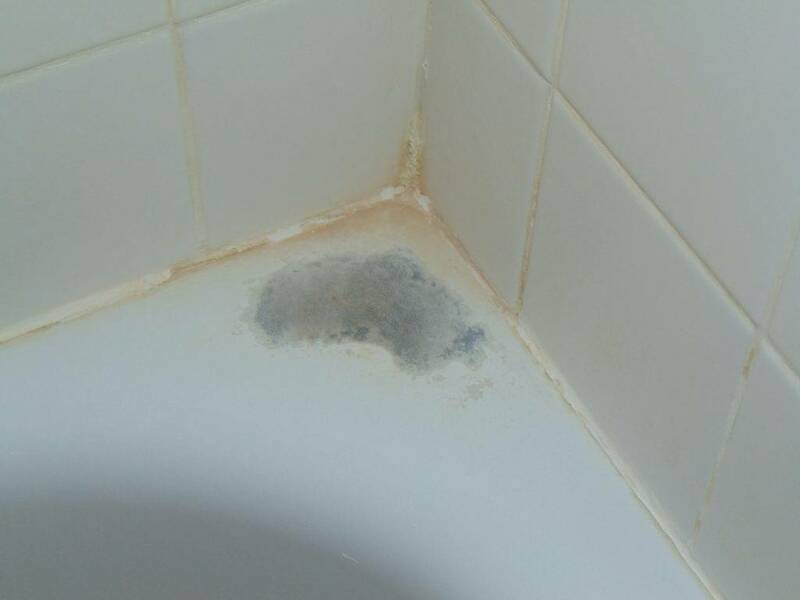 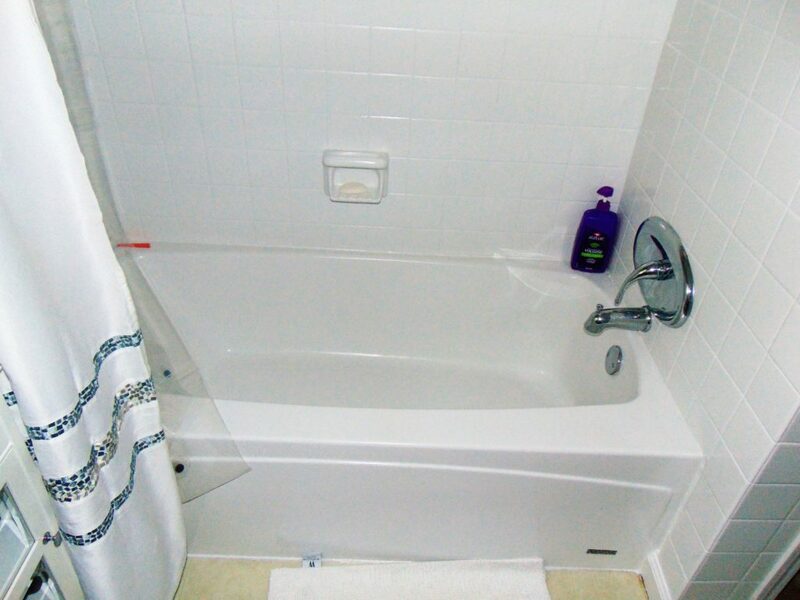 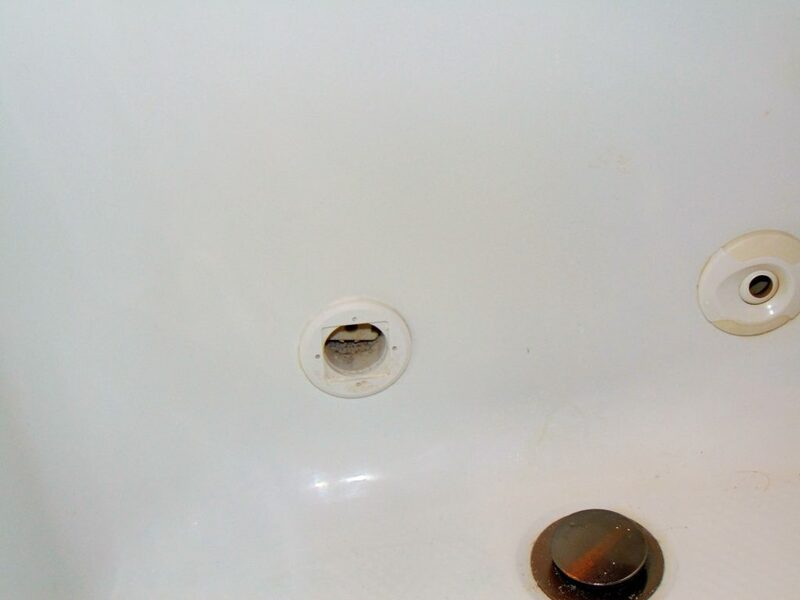 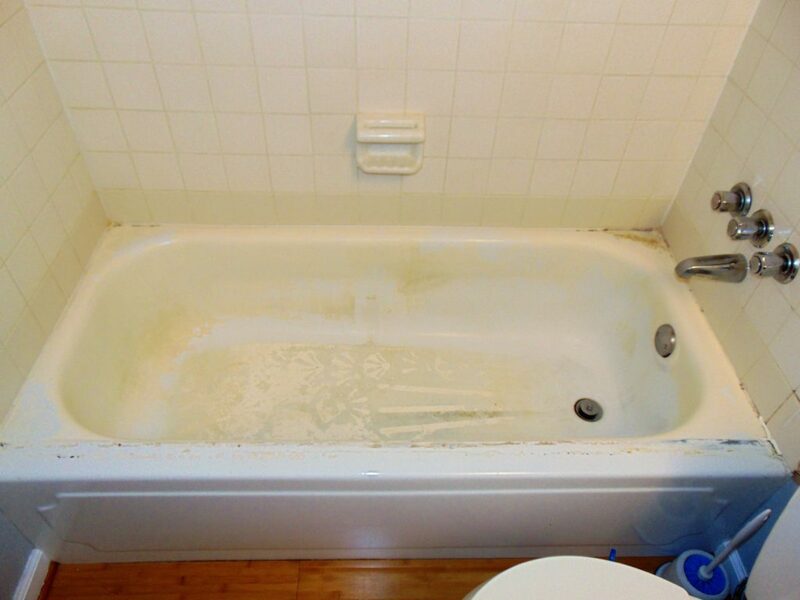 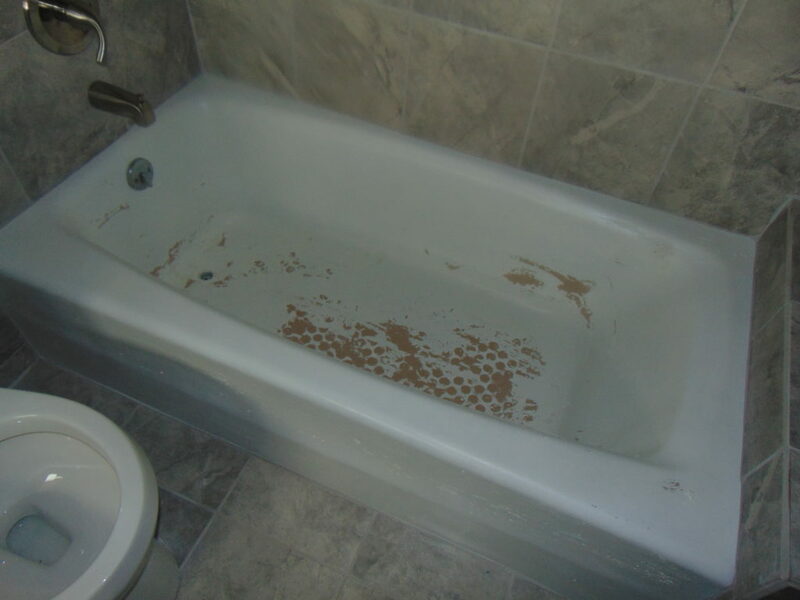 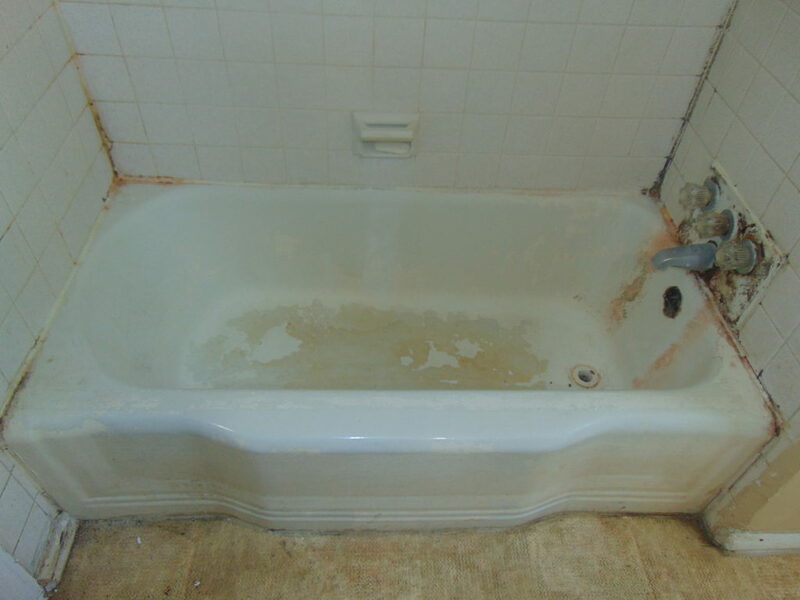 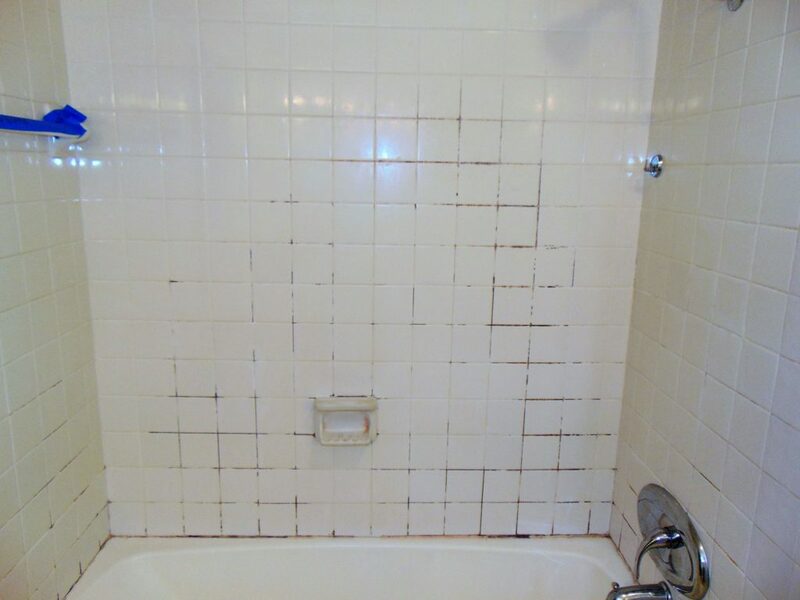 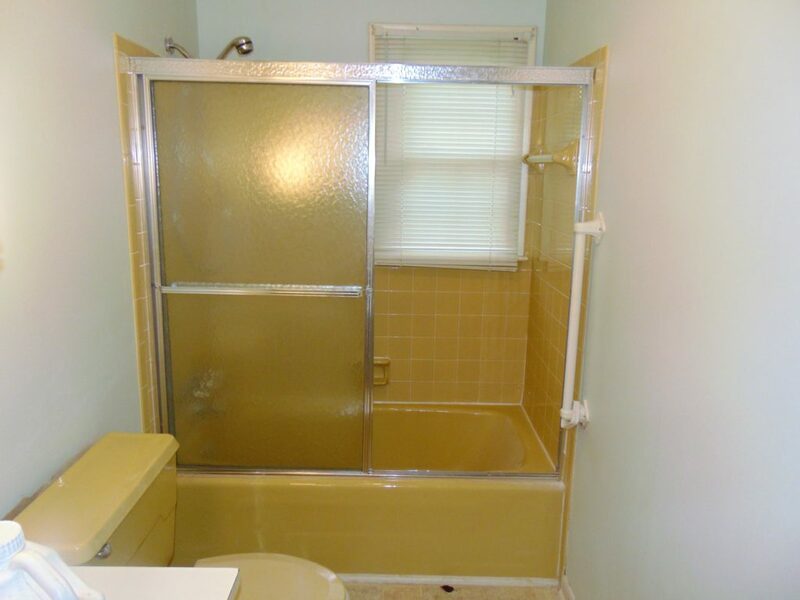 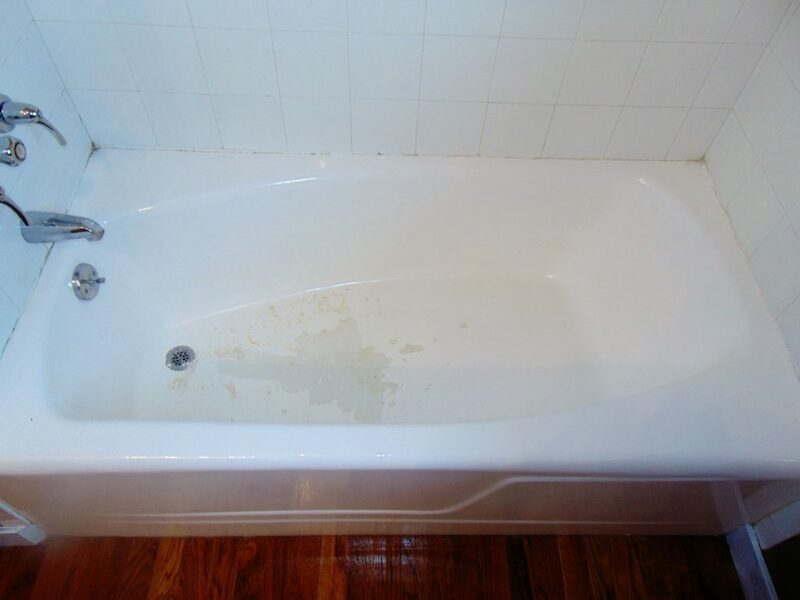 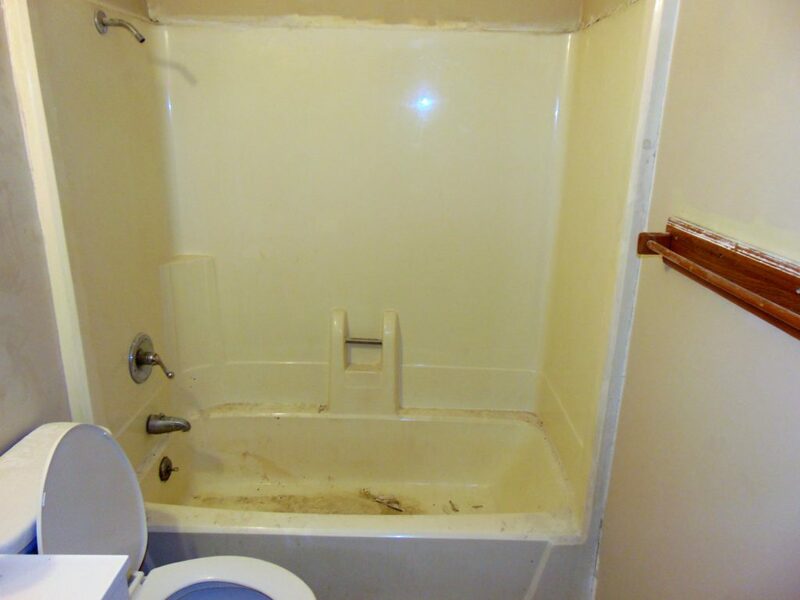 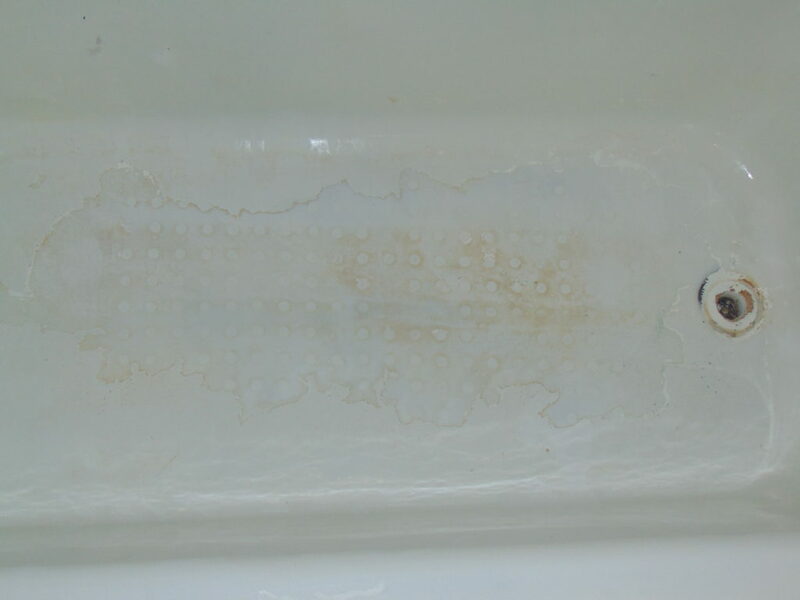 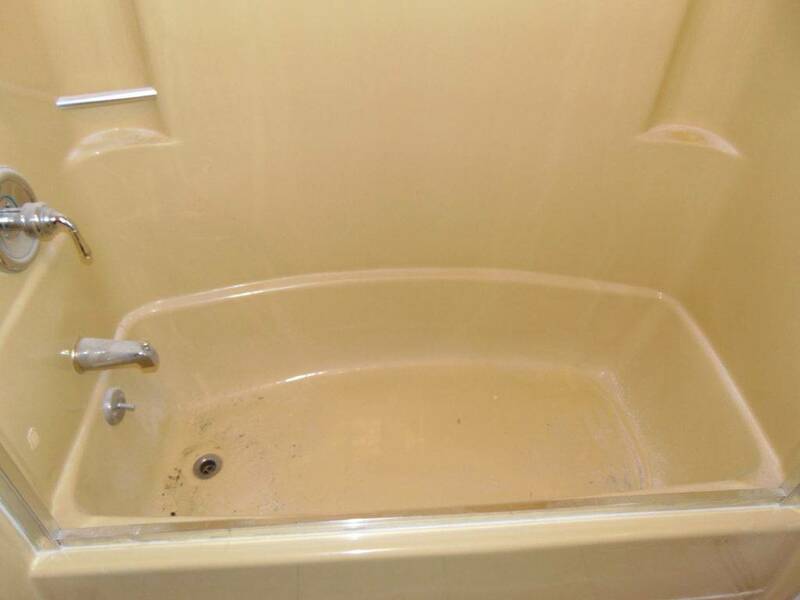 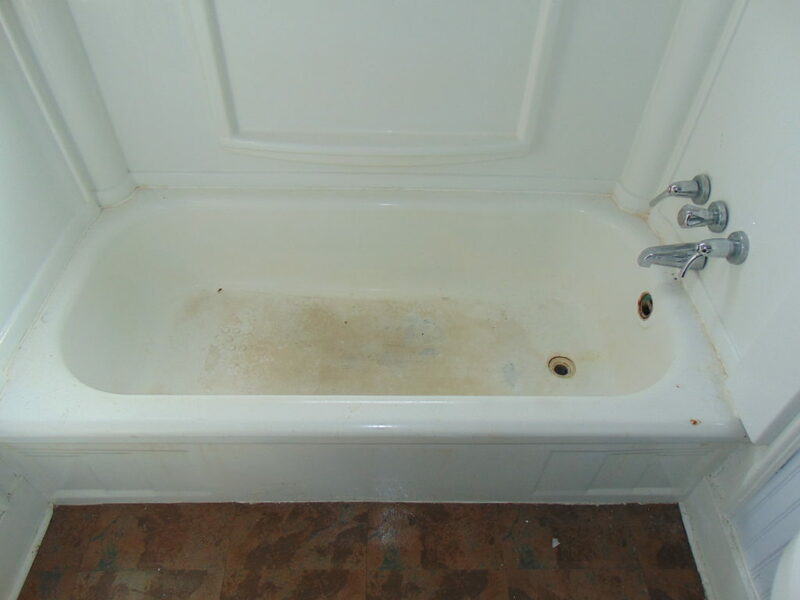 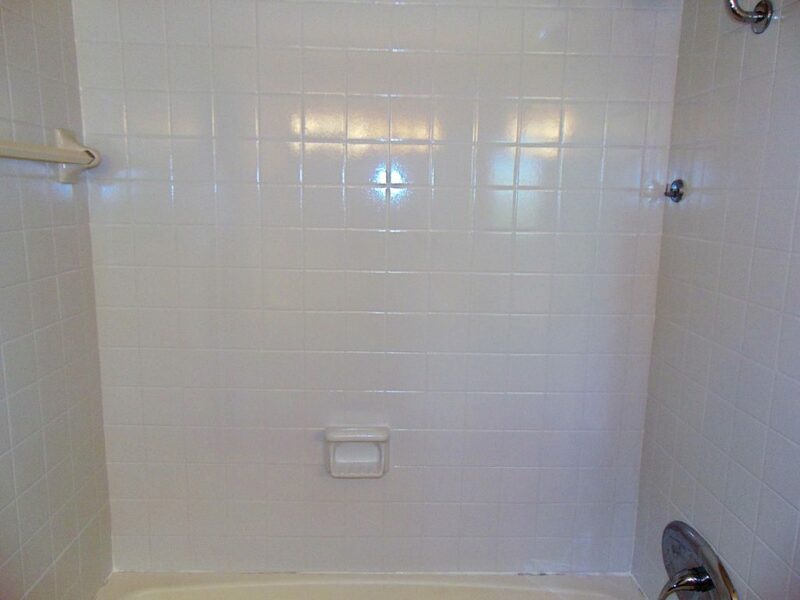 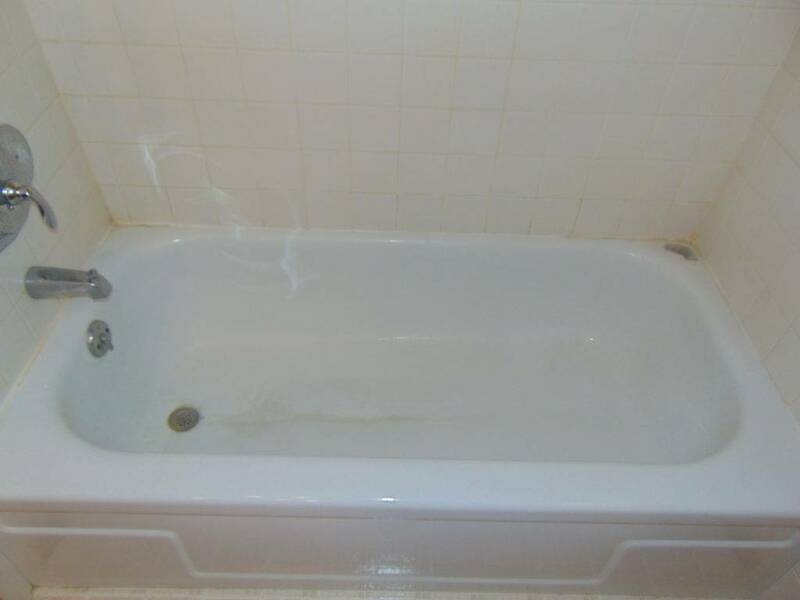 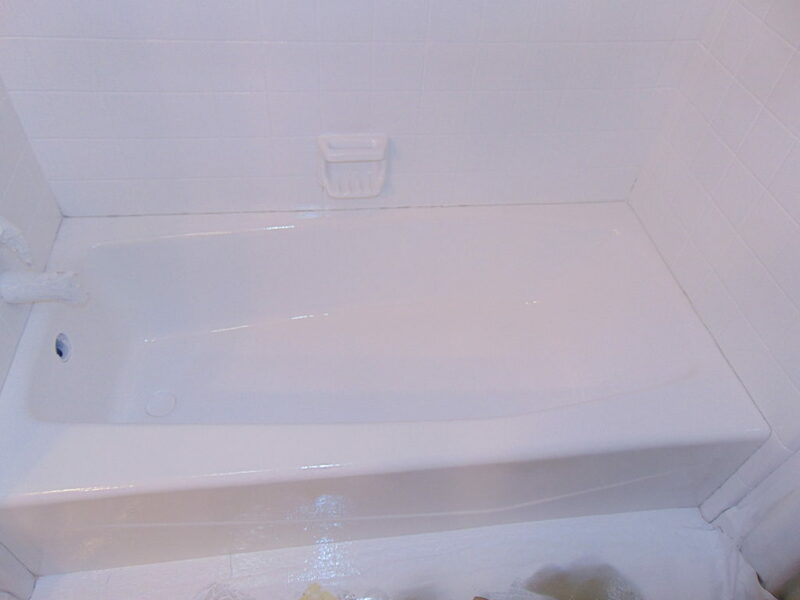 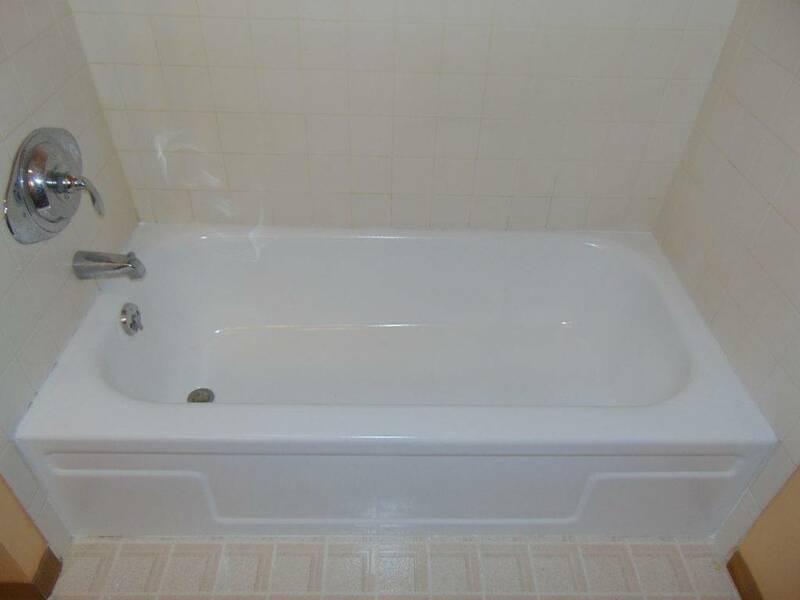 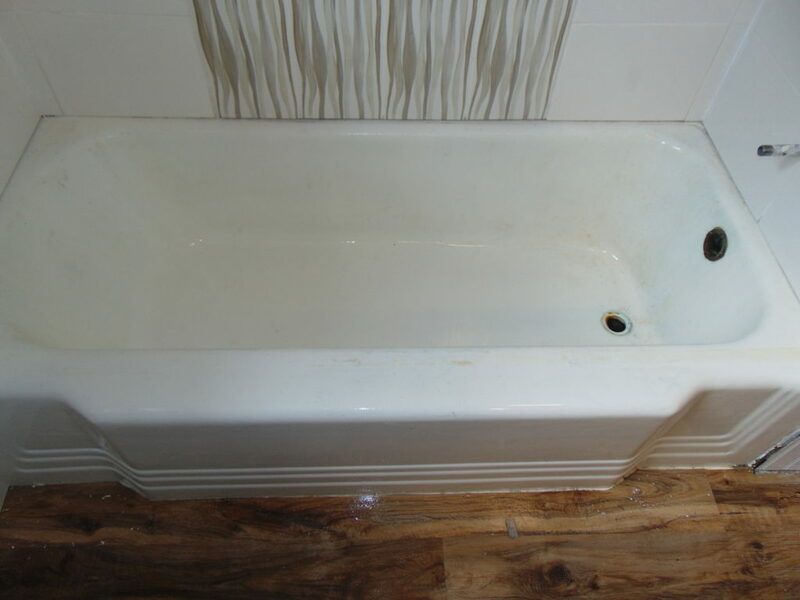 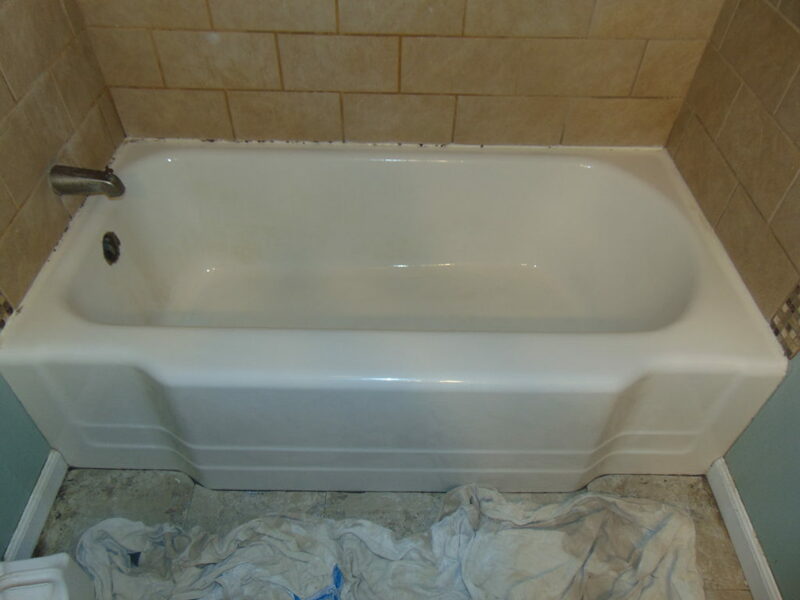 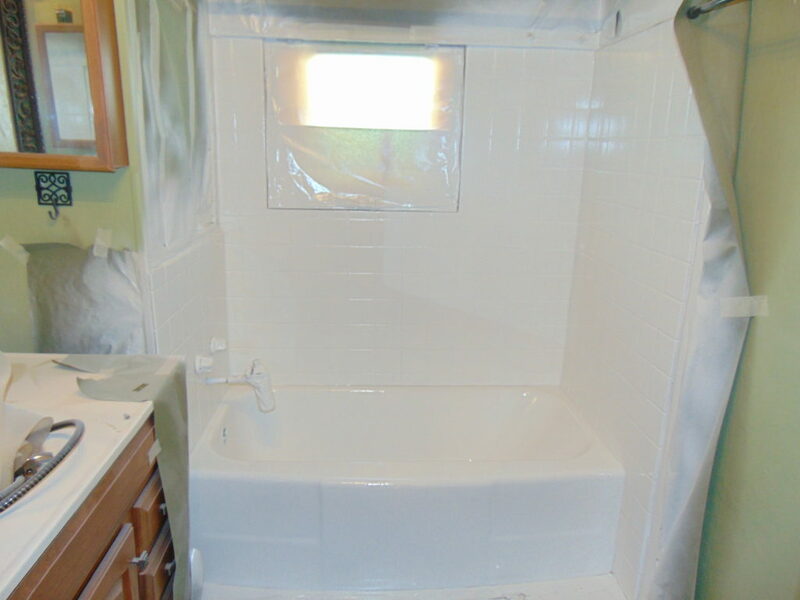 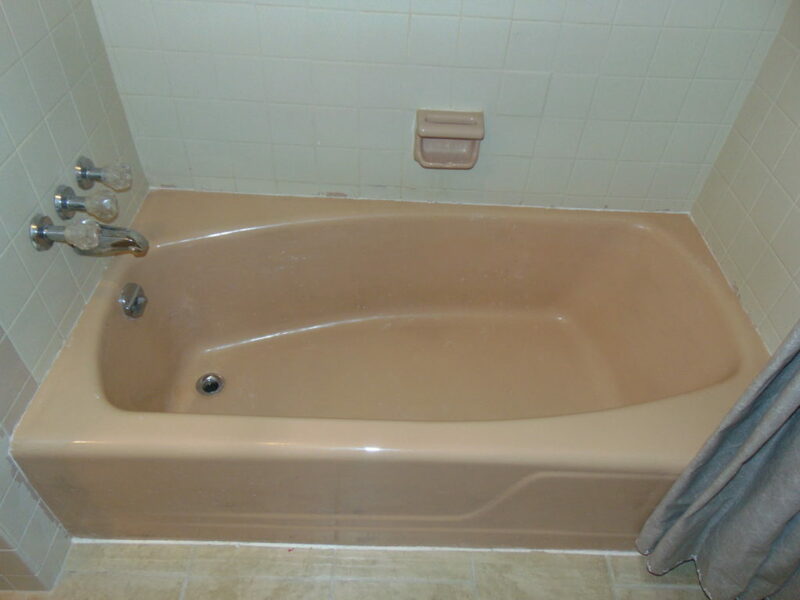 Check out our bathtub reglazing before and after pictures in Tri-Cities, TN. 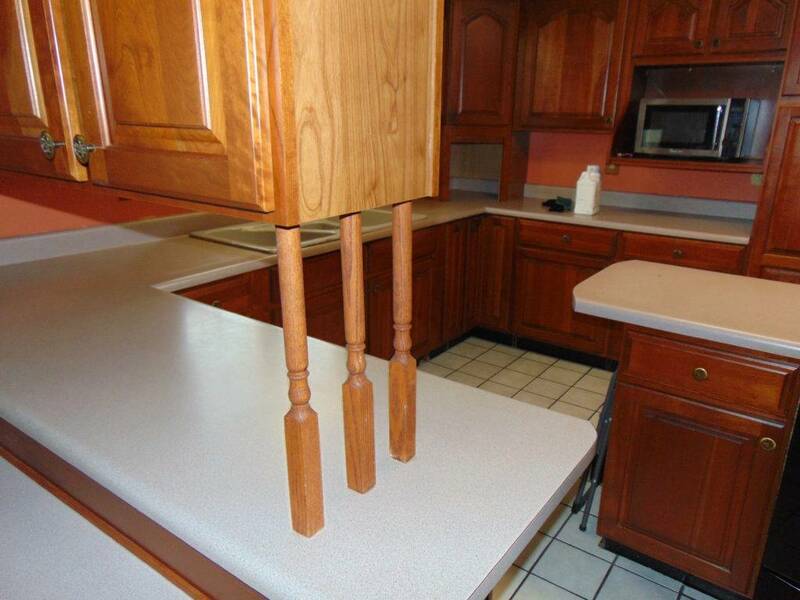 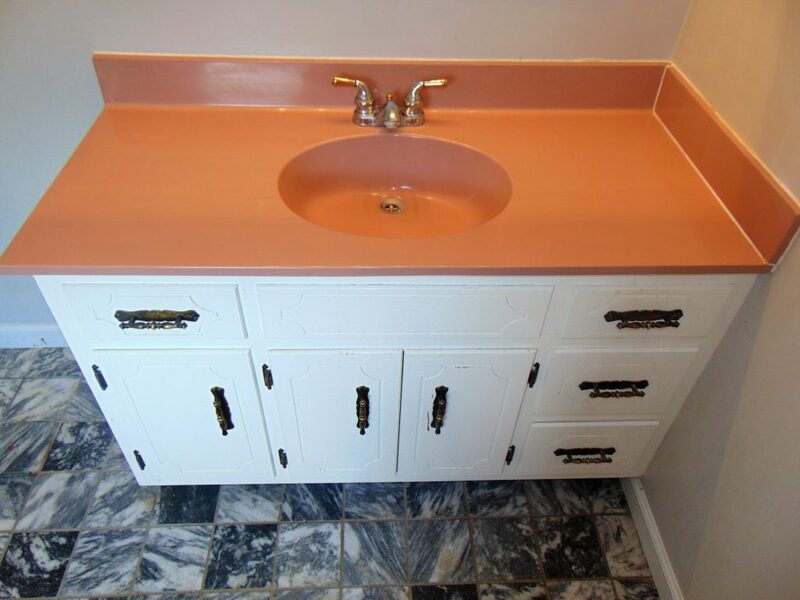 Call Miraculous Makeovers today at (423) 612-4174 and let us help with your next kitchen or bath update. 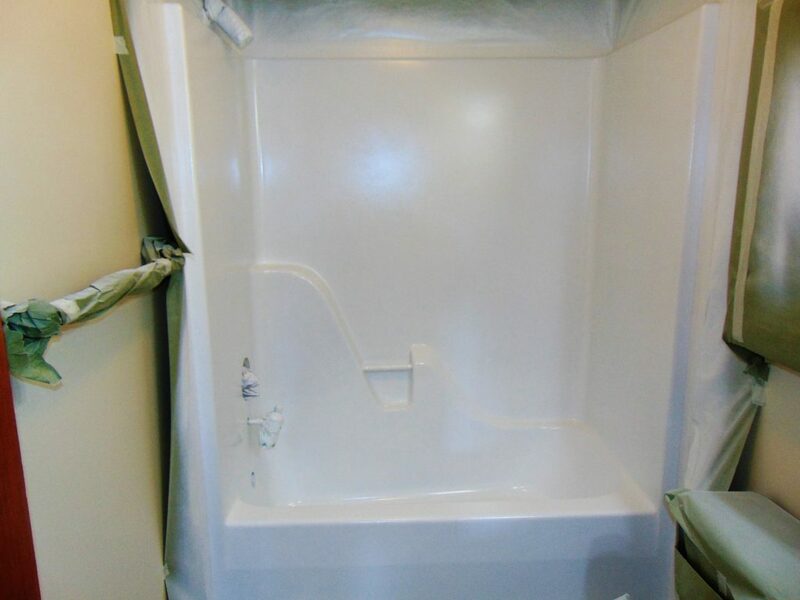 Click here to take advantage of our online specials page! 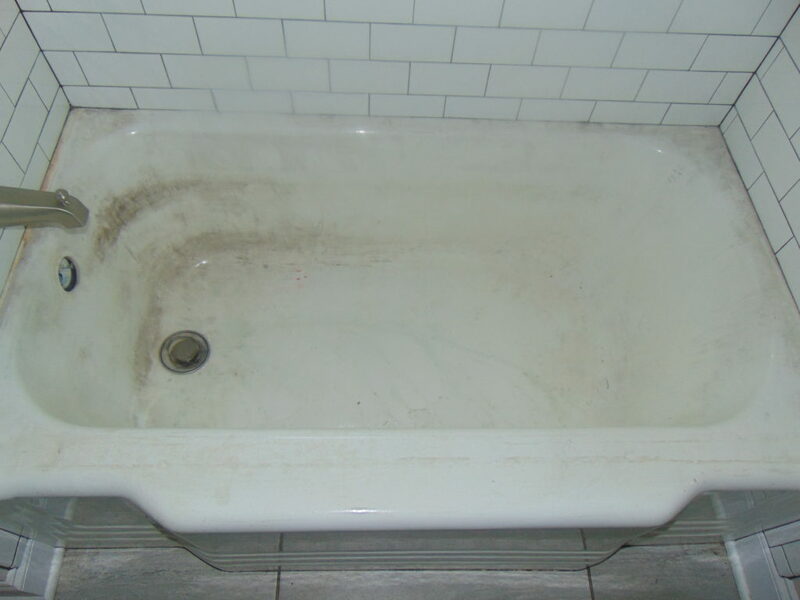 Filthy Dirt Brown to Good-Looking in Less Than 2 Days! 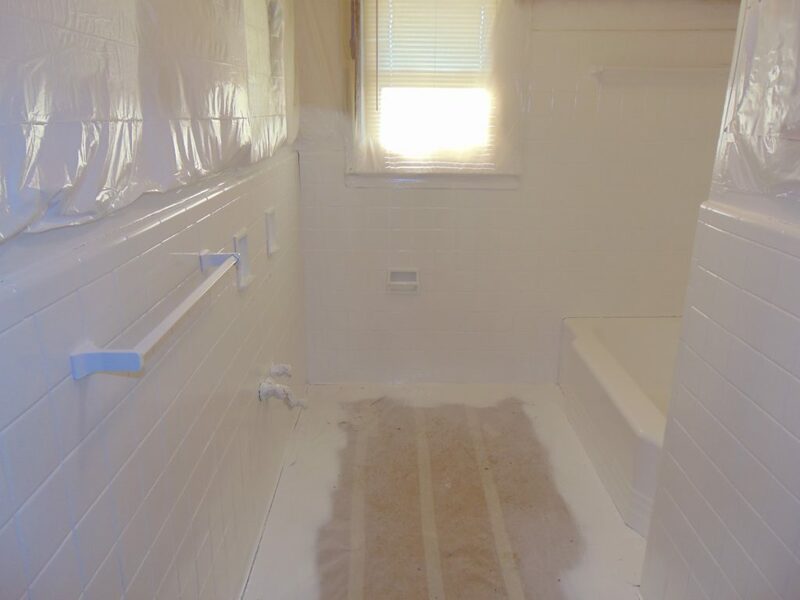 From an outdated brown to a pure white made this bathroom feel spacious, refinishing allows you to enjoy comfortable showering. 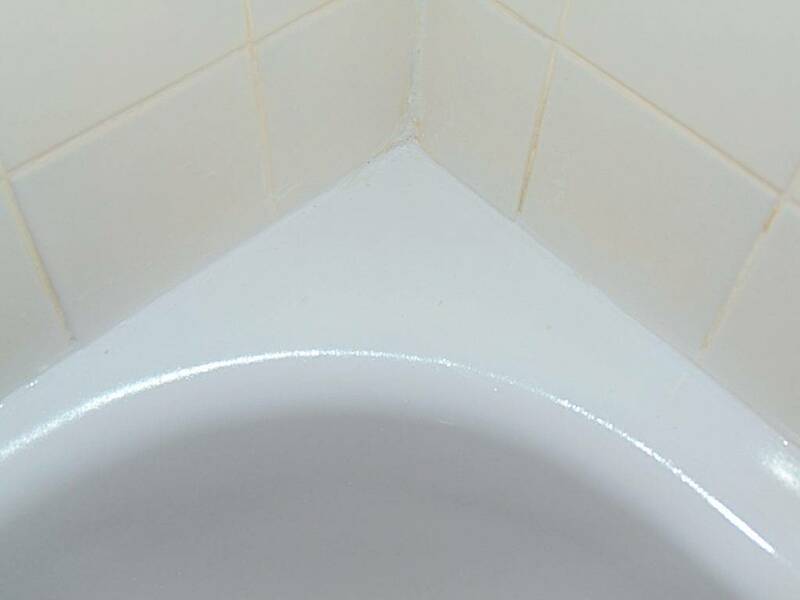 Permanently sealed grout lines provide protection from mildew growth. 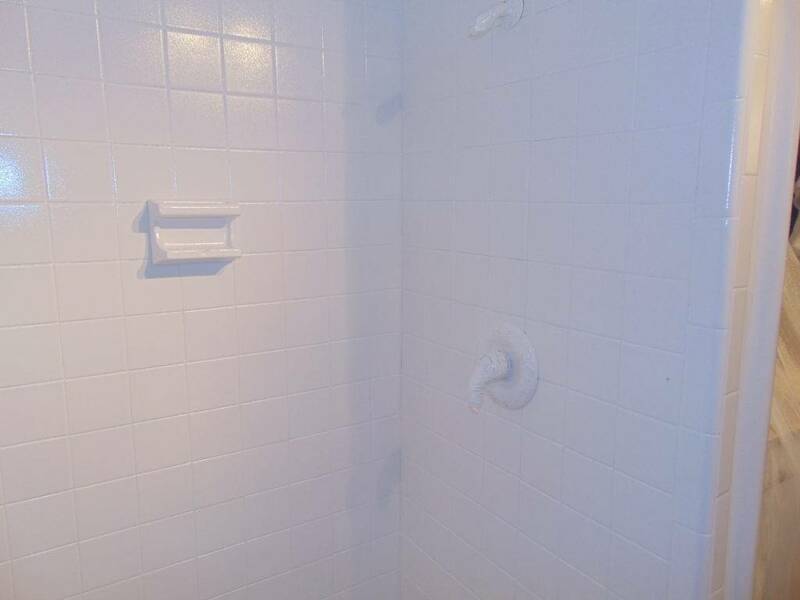 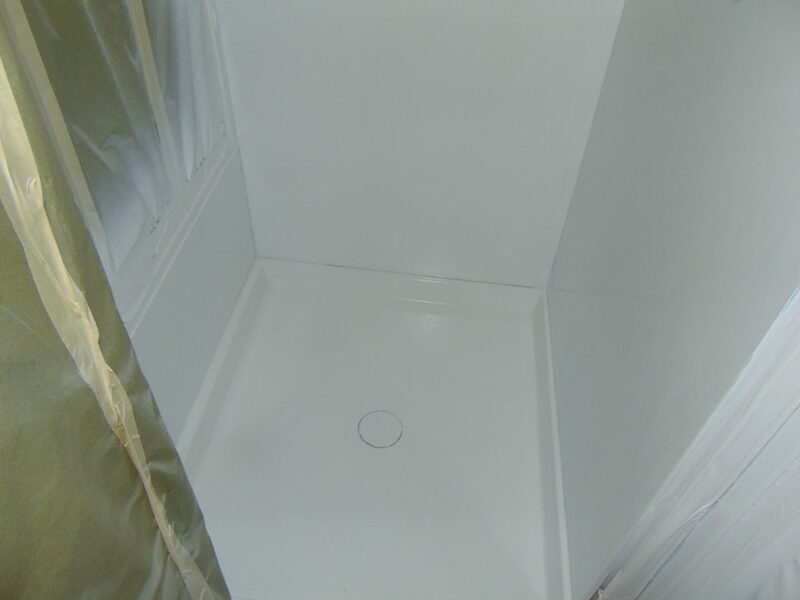 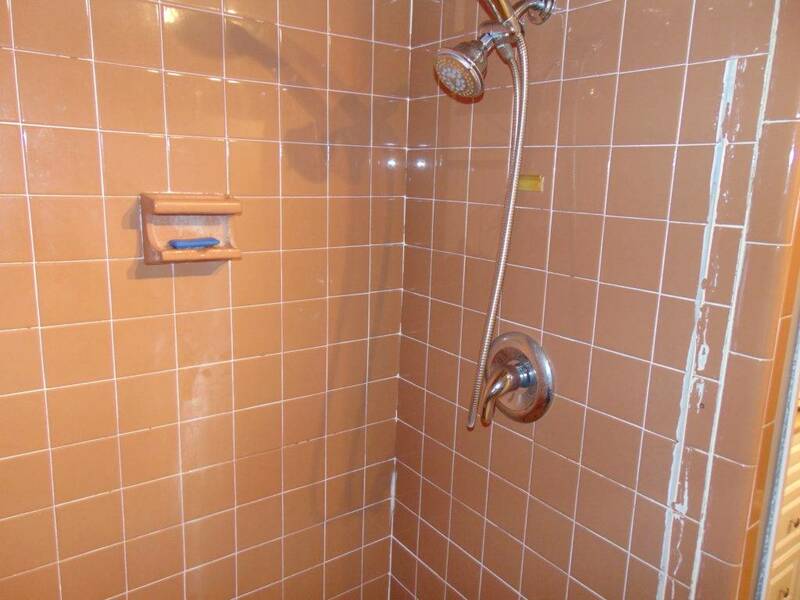 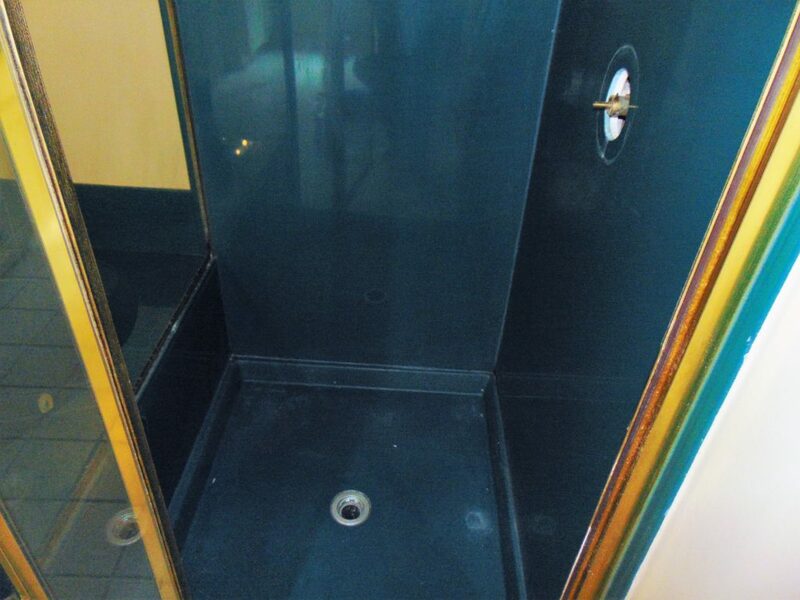 The shower stall is glossy and smooth to the touch, consisting of 2 applications of our bonding agent, 2 layers of epoxy primer and 4 coats of topcoat. 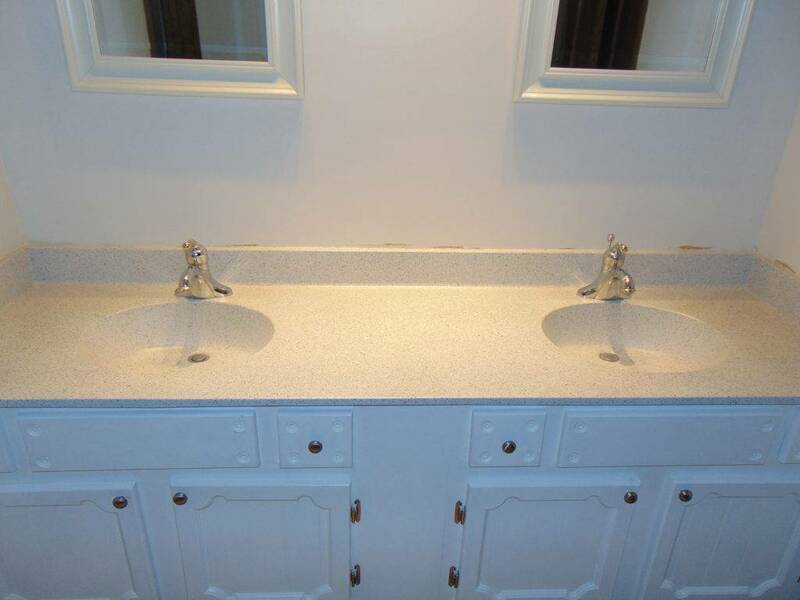 Pure white is optional many colors are available. 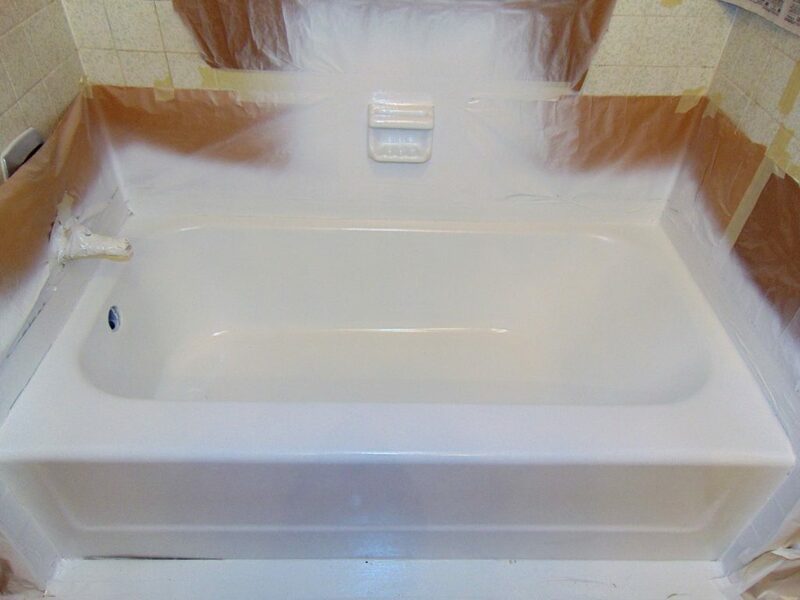 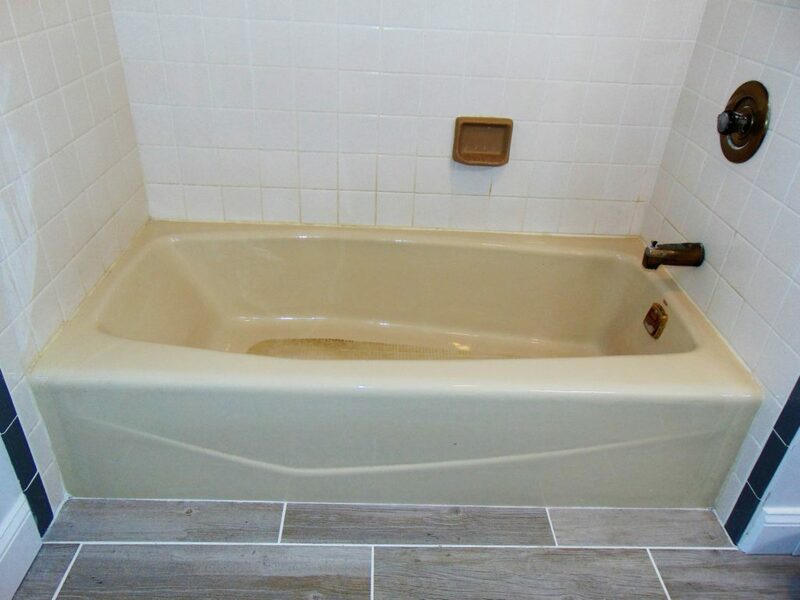 Bathtub refinishing lets you enjoy a like-new remodel without the headache of demolition, soak and relax in a newly refinished tub without breaking the bank. 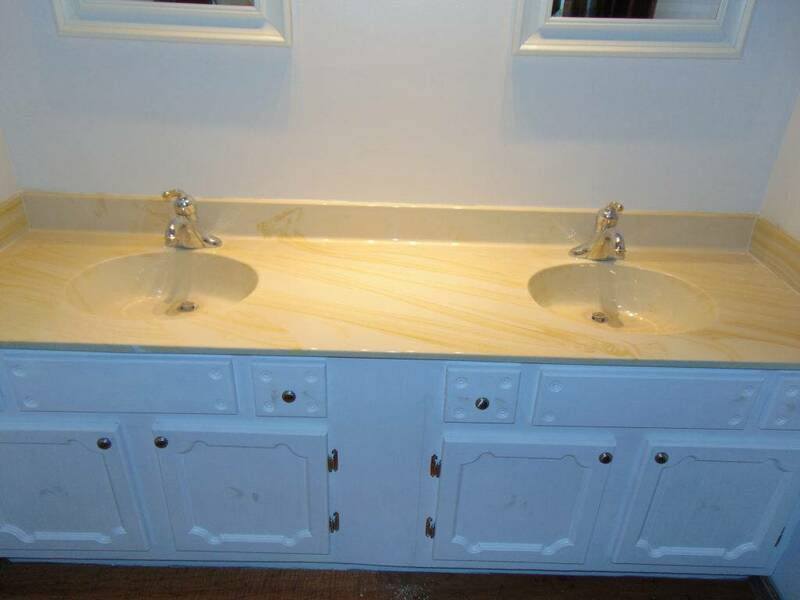 Miraculous Makeovers products give an appearance that you cant tell from new, professionally refinished detail rich with character. 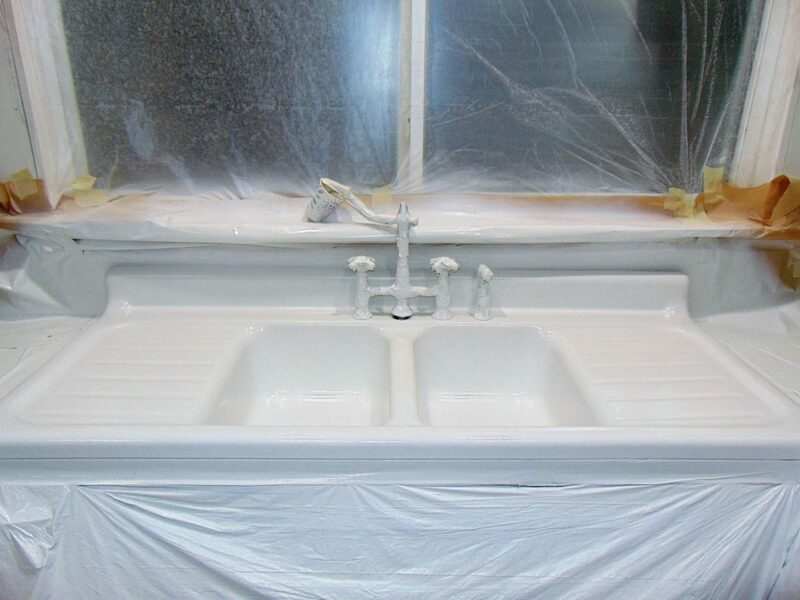 Our superior coatings are easy to clean, with a high-gloss finish. 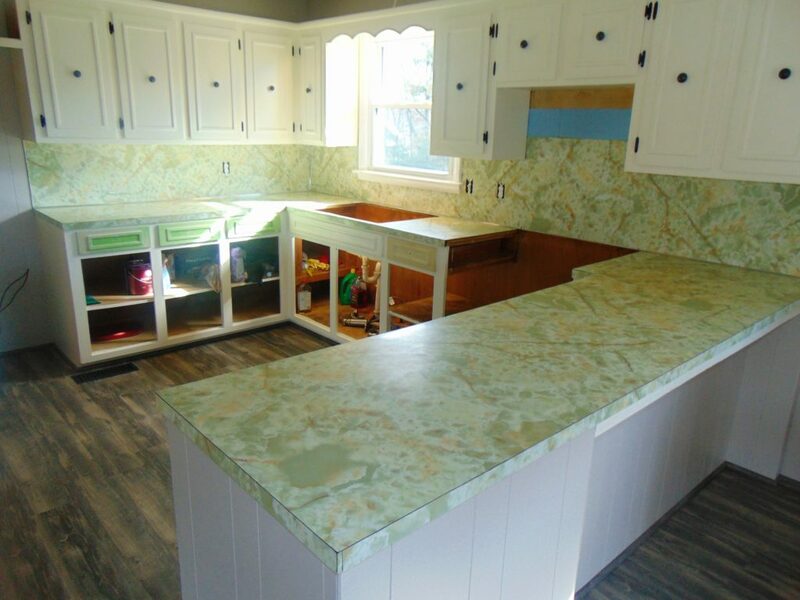 Expired Cream Swirl to Stone-looking in One Day! 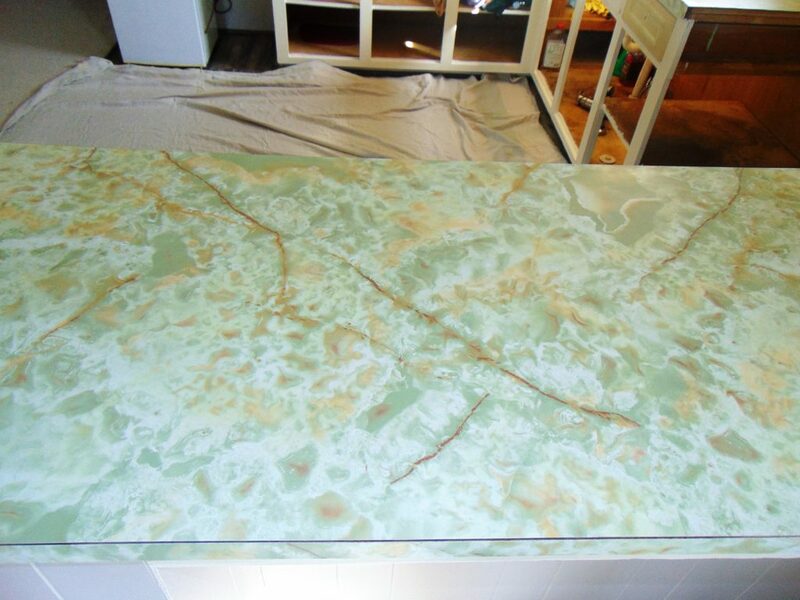 Breathtaking stone finishes meet the 10 year experience of Miraculous Makeovers. 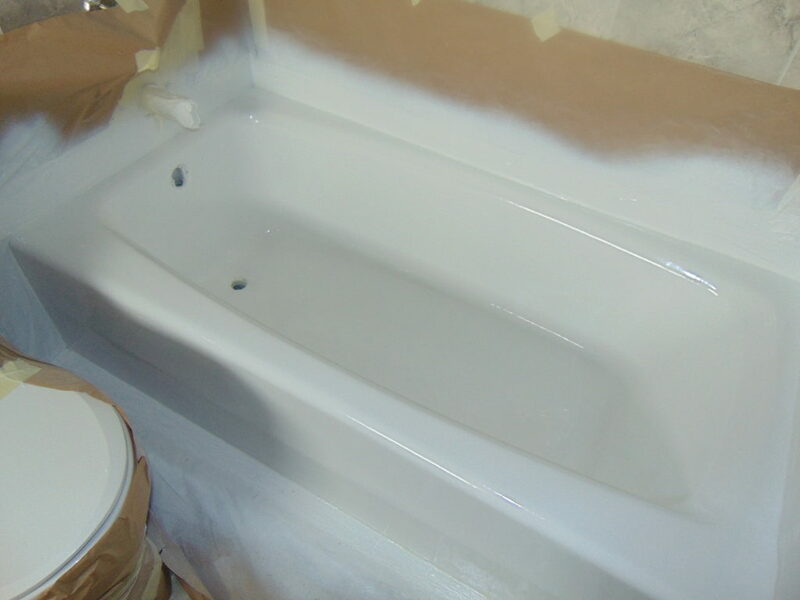 In the process of refinishing, nothing was overlooked from the beautiful summit gray specs to the AMAZING pure white base coat. 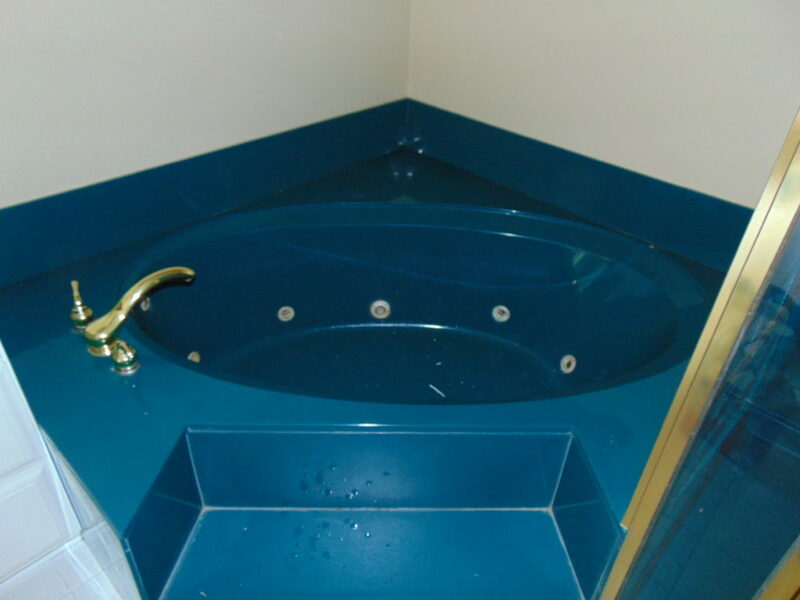 Many colors are available to help create your own look. 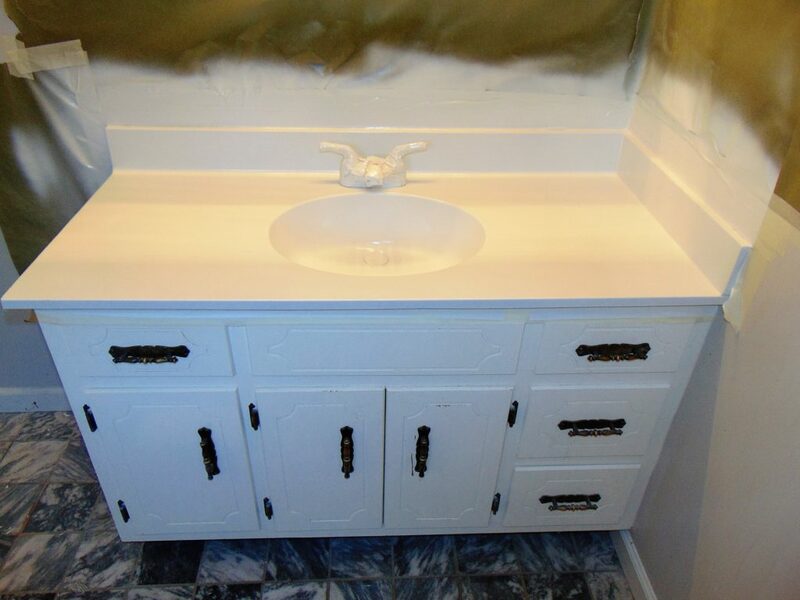 This summit gray vanity top was refinished to bring rich detail to an outdated bathroom in Bristol, TN. 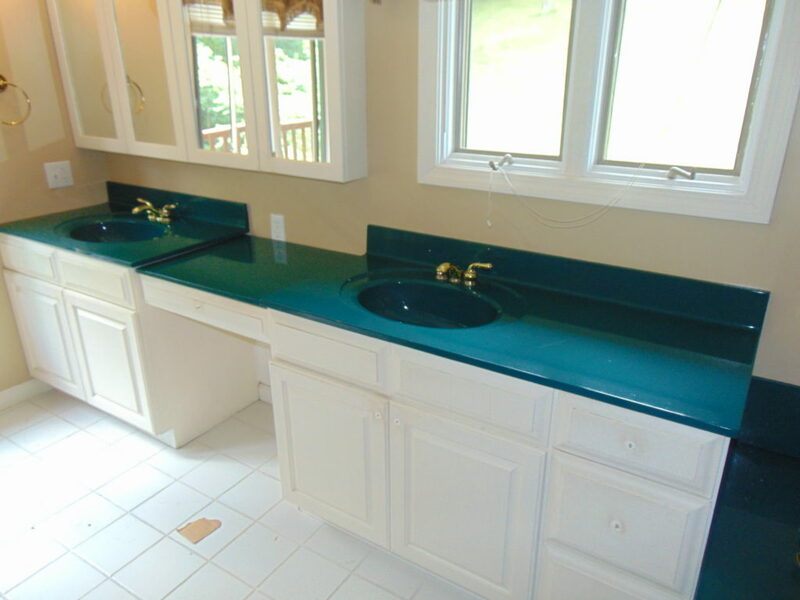 Complete your bathroom remodel with our vanity top refinishing services. 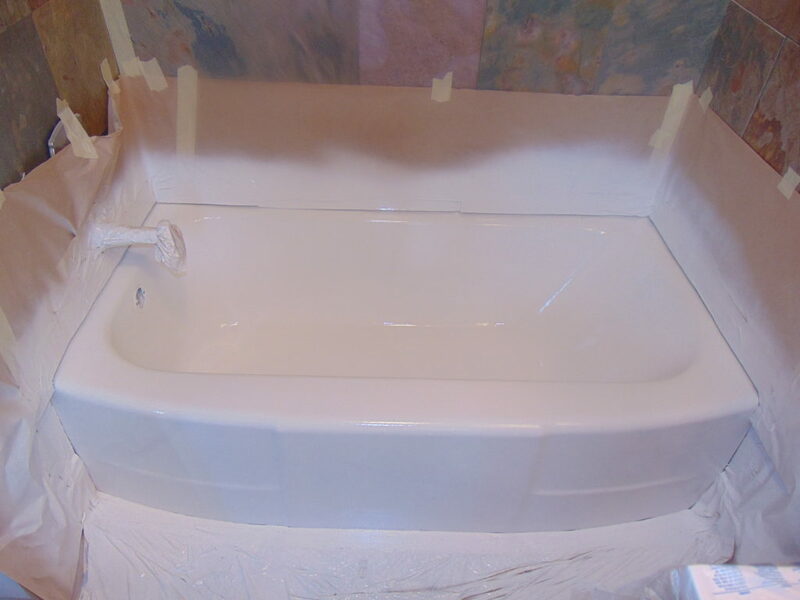 Surround yourself with happiness and comfort in a new refinished one-piece tub. 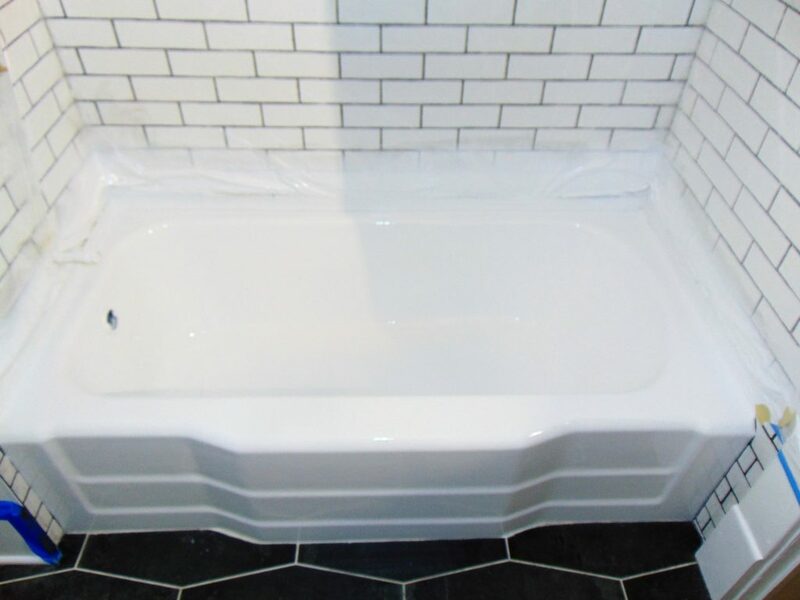 With its gracefully shaped lines this once ugly bath was brought back to life and ready to compete with any modern day bathroom style. 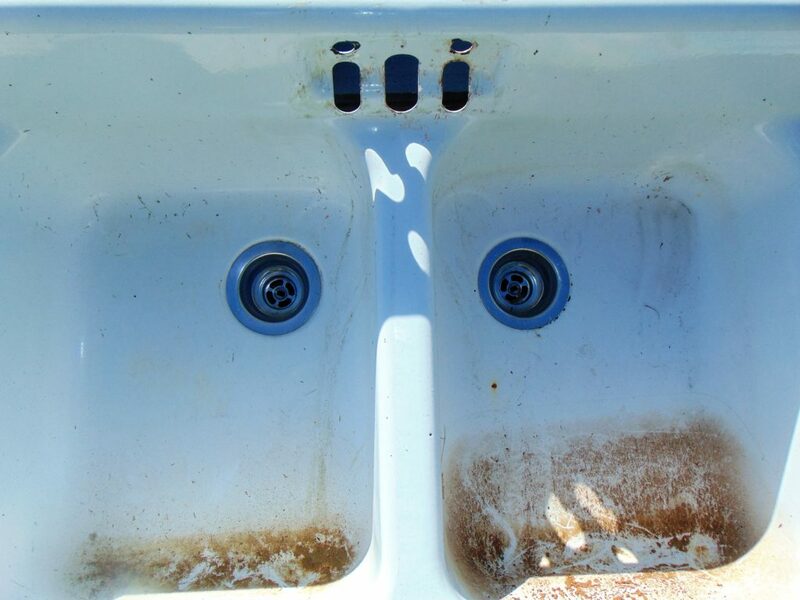 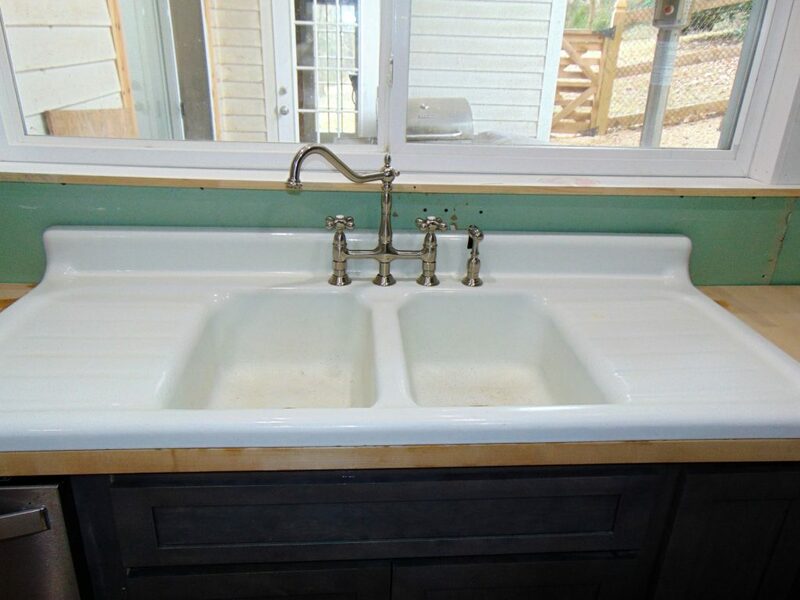 Old Junkyard Sink Brought Back to Life! 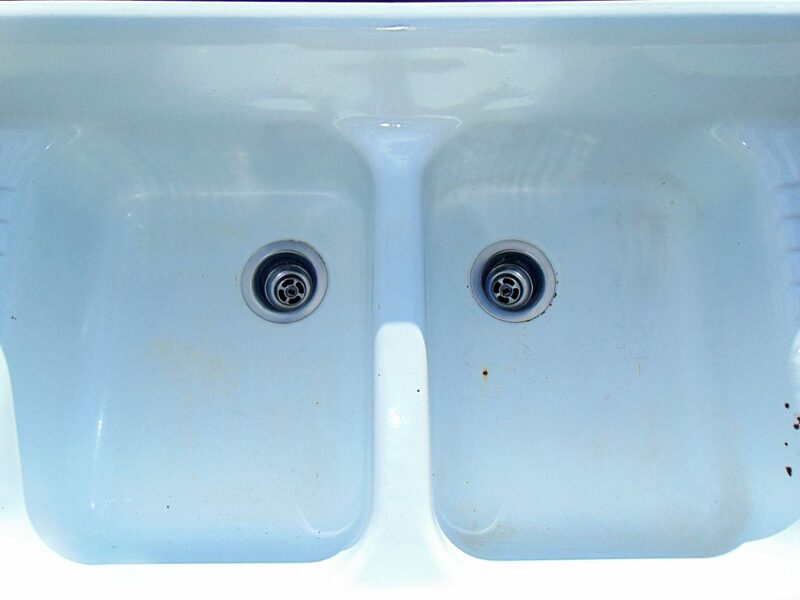 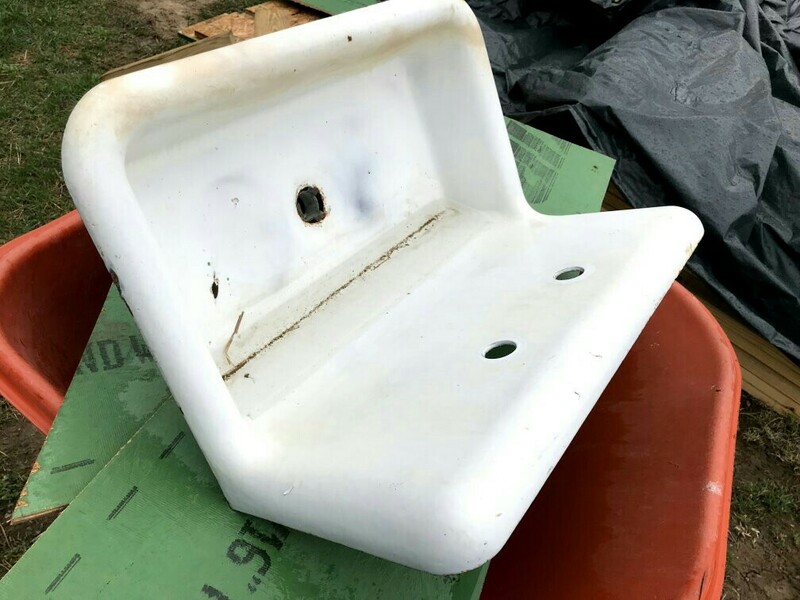 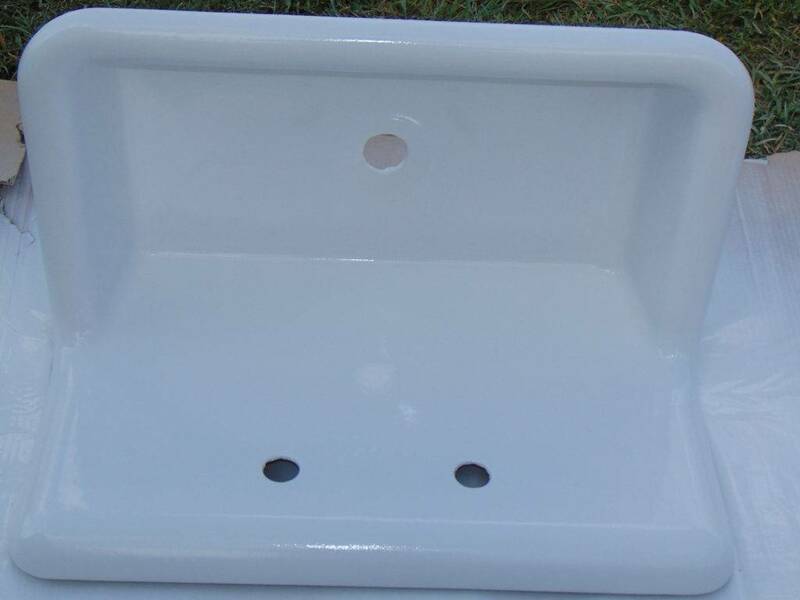 After refinishing, this sink is ideal for vintage or modern day bathroom styles. 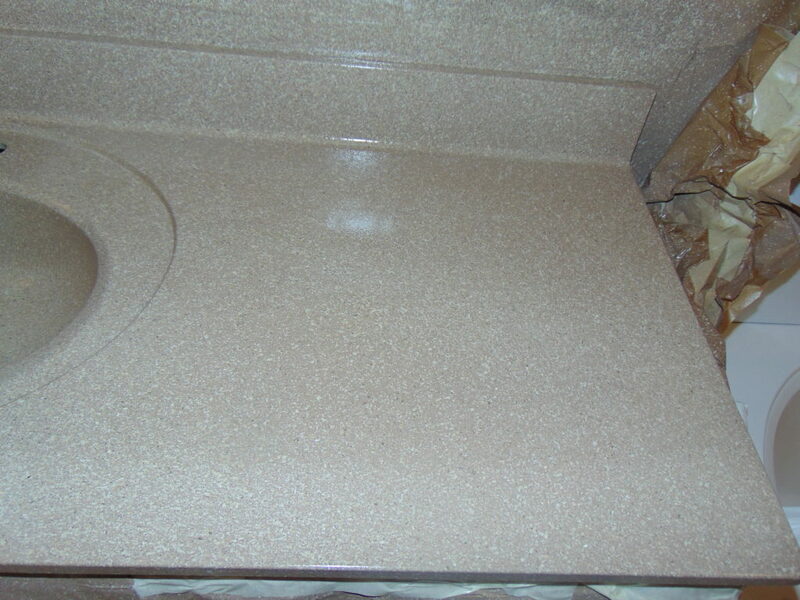 The newly refinished surface allows easy cleaning as well as giving your outdated bathroom a brand new look. 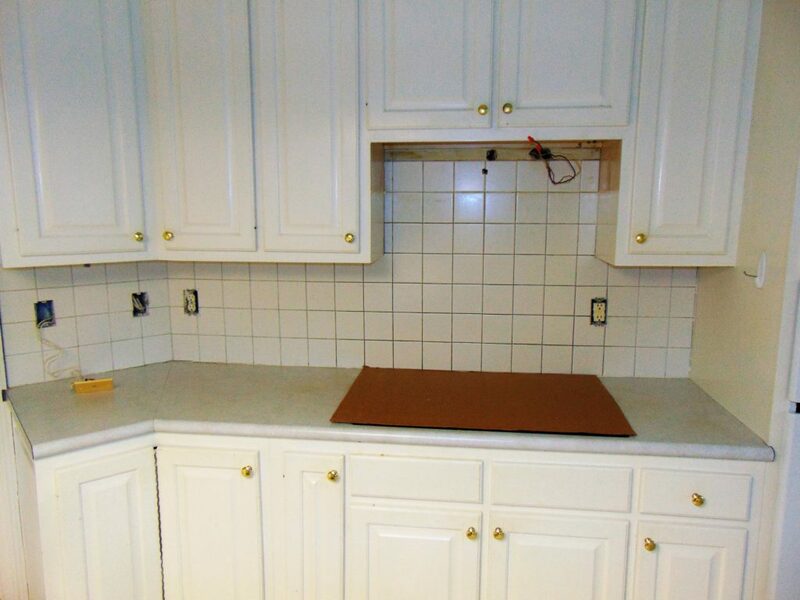 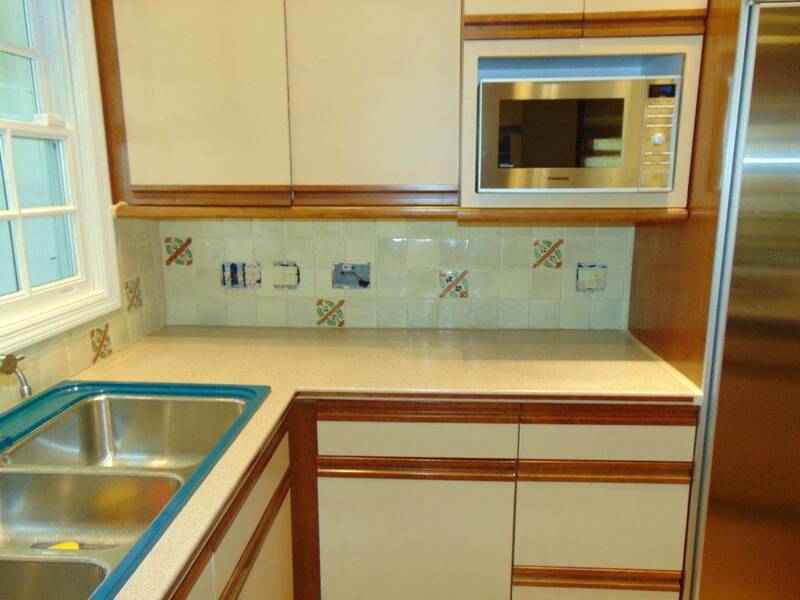 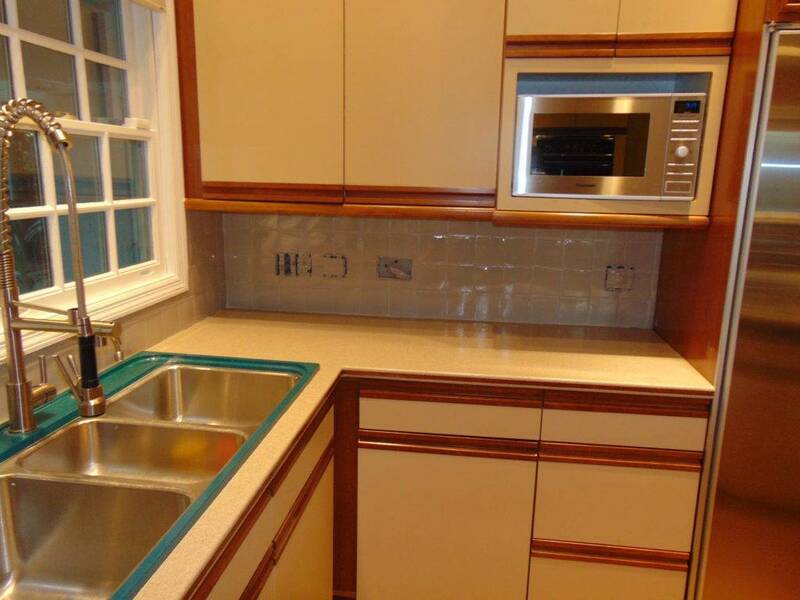 Kitchen backsplash refinishing makes it easier than ever to update your existing kitchen tile. 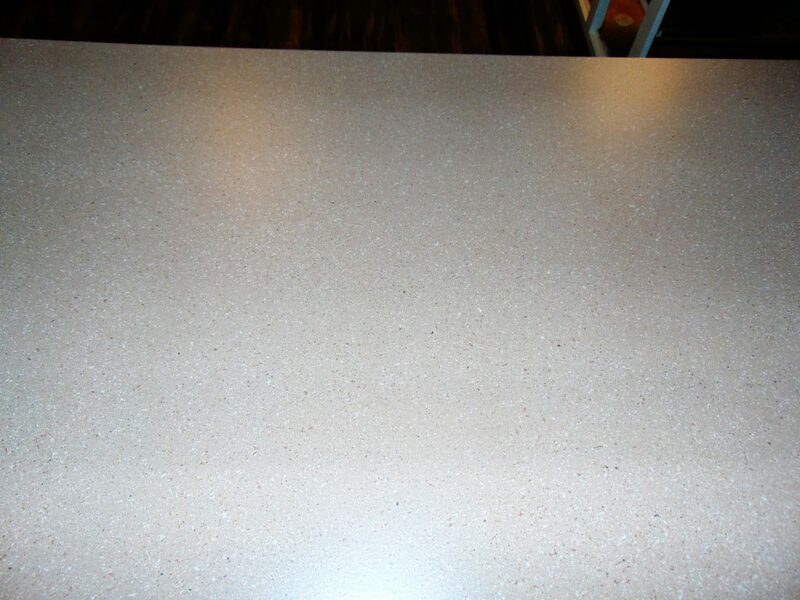 Refinish your backsplash to personalize your entire kitchen area. 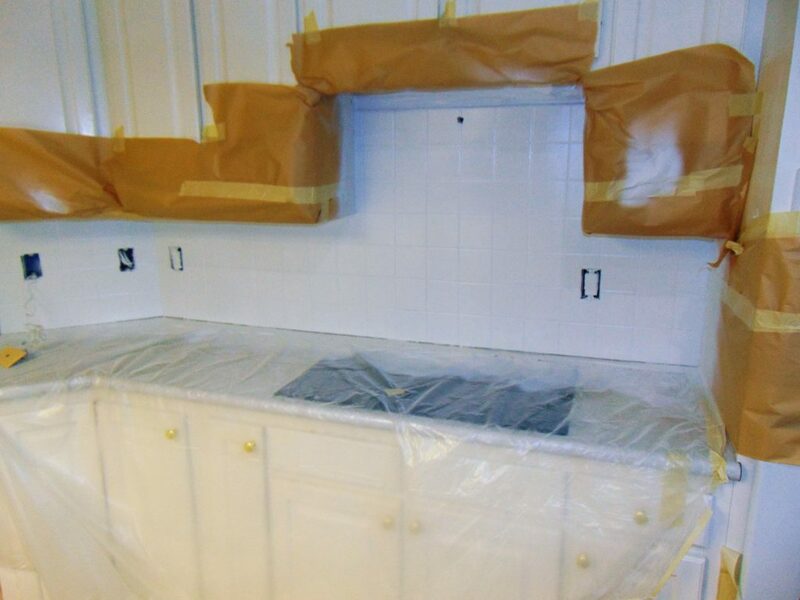 Simplify your kitchen remodel without demolition or removal. 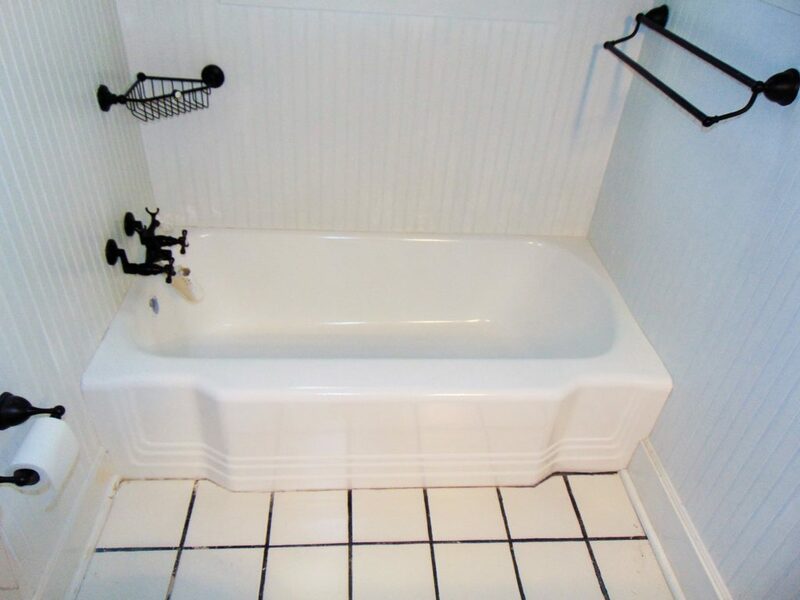 The perfect cast iron tub design! 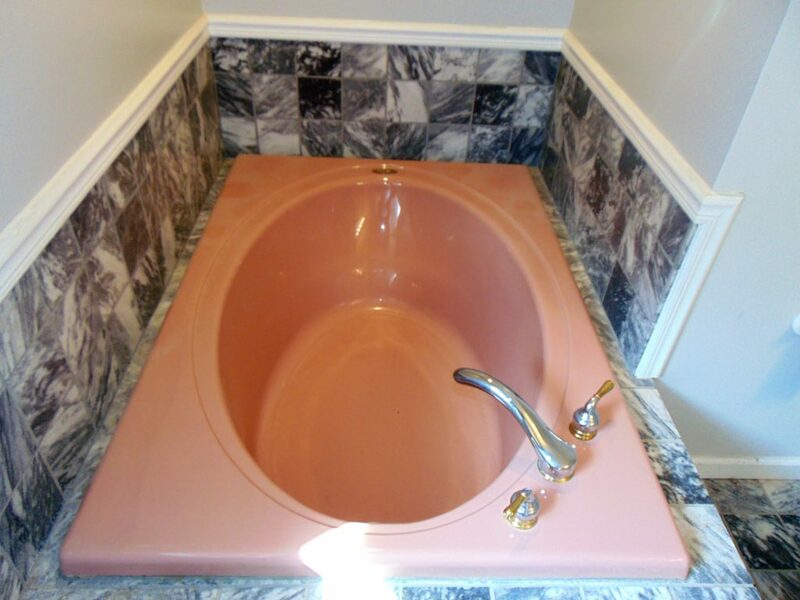 Curvy edges and beautiful lines give this unique tub its mass appeal. 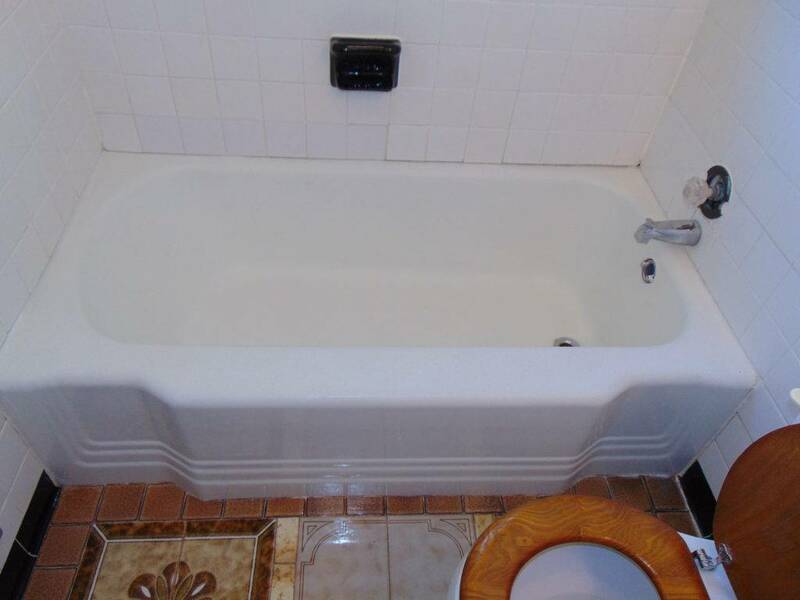 Plenty of leg room and can last you a life-time. 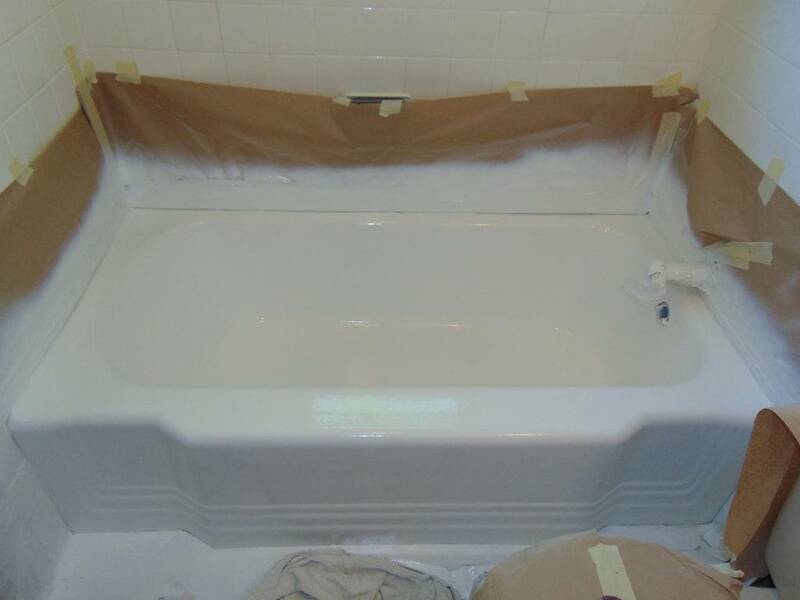 This bathtub drain repair in Kingsport, TN is flawless. 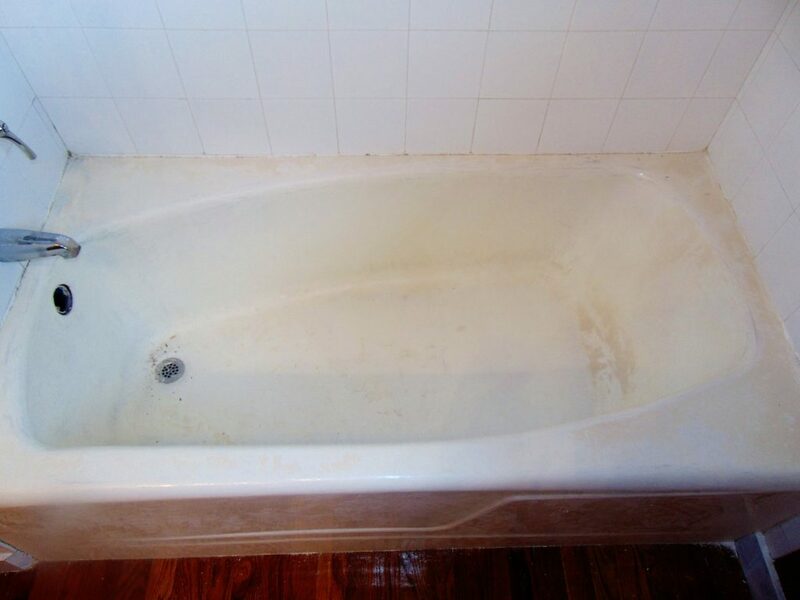 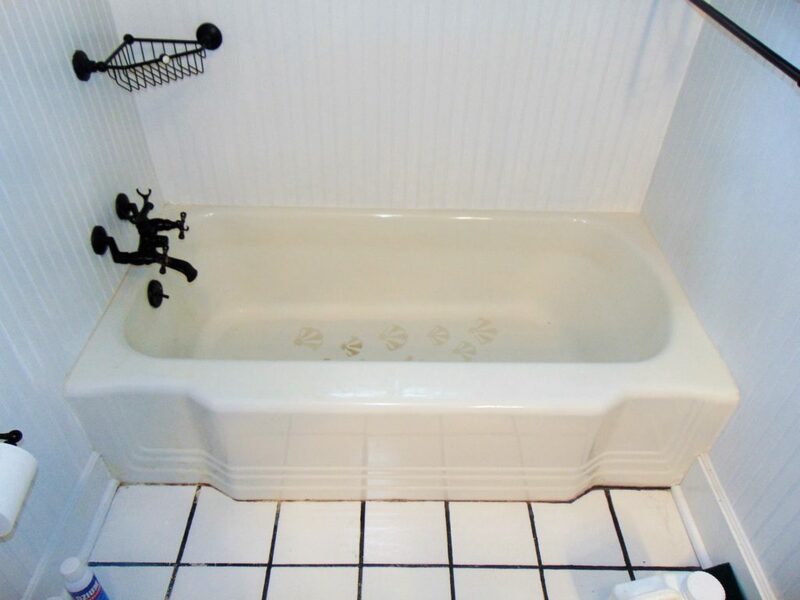 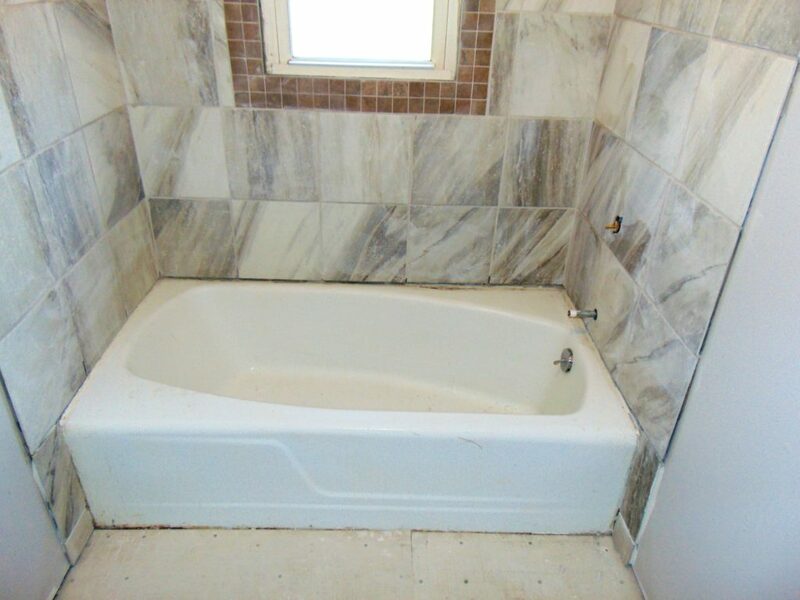 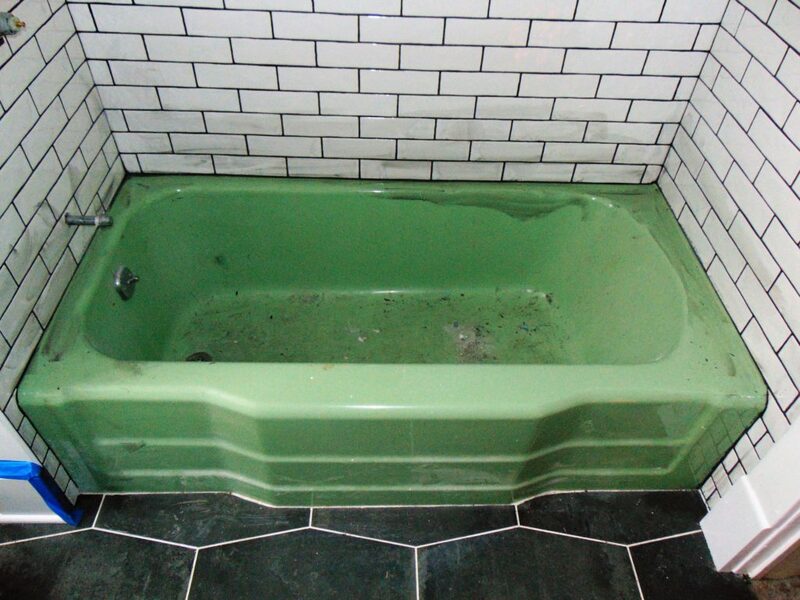 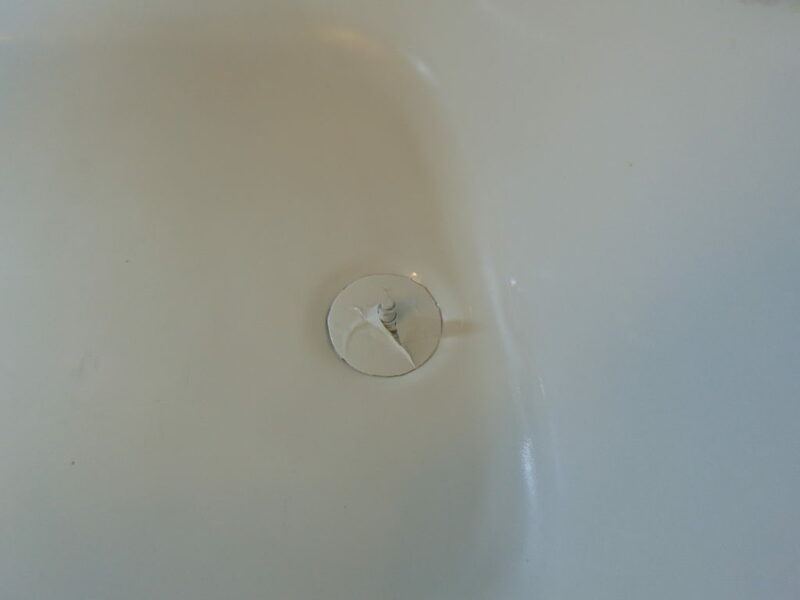 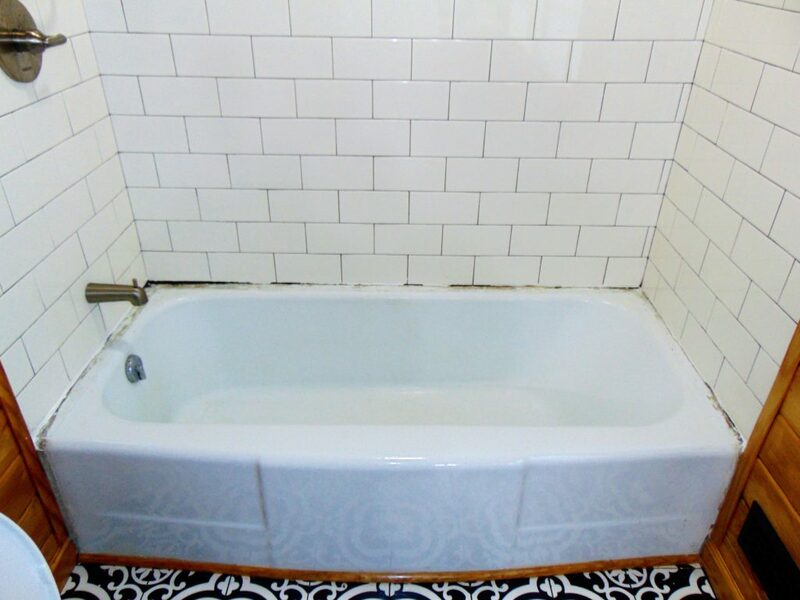 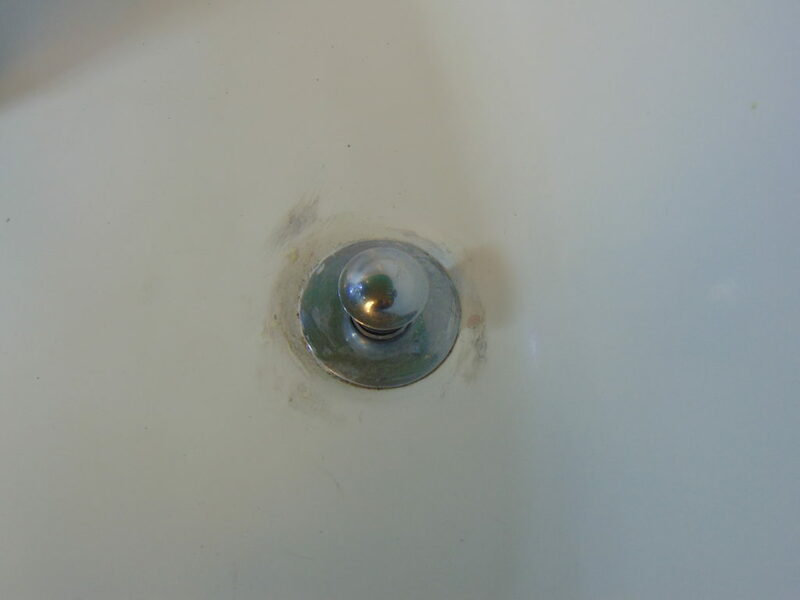 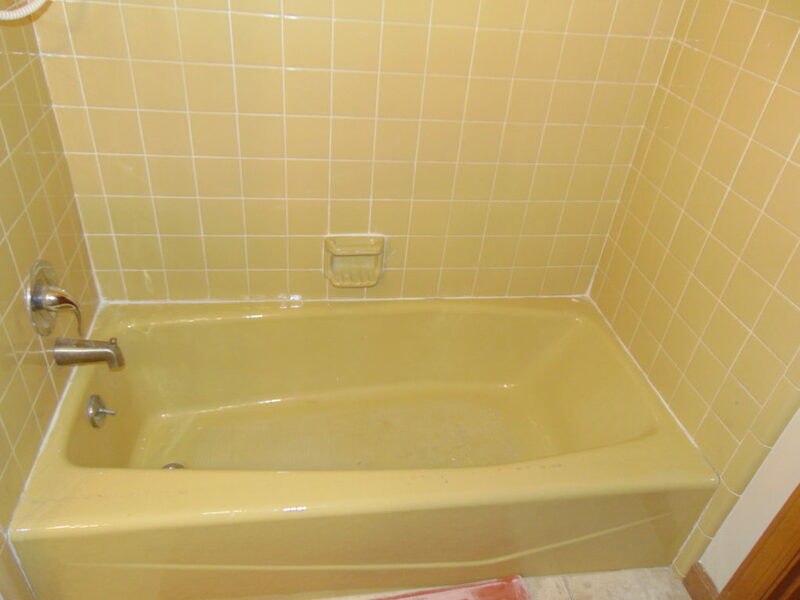 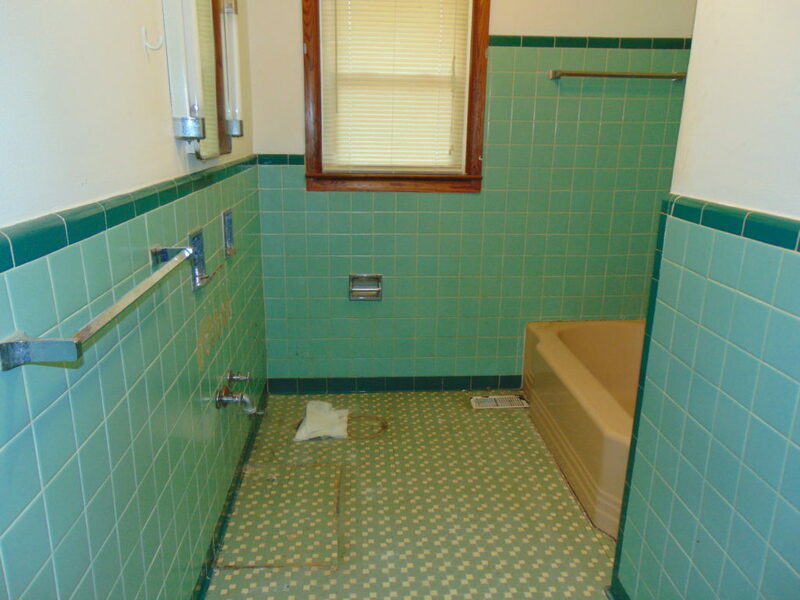 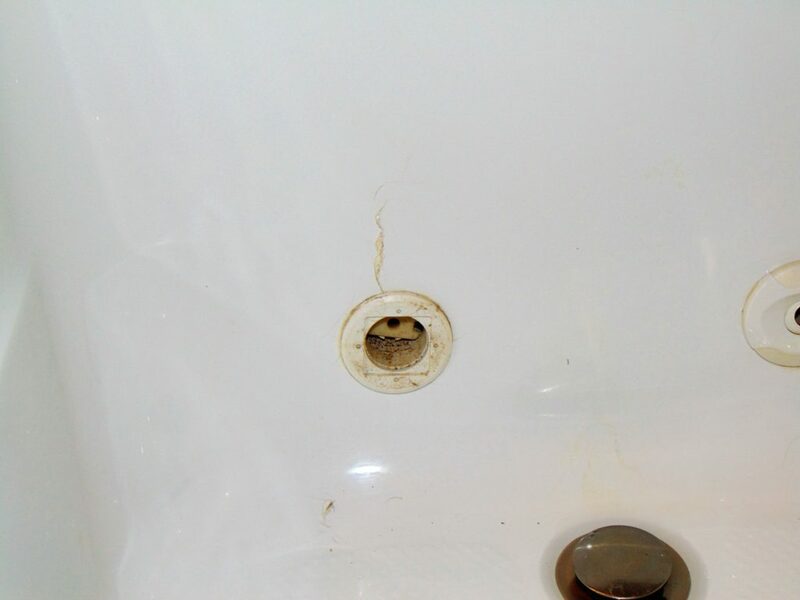 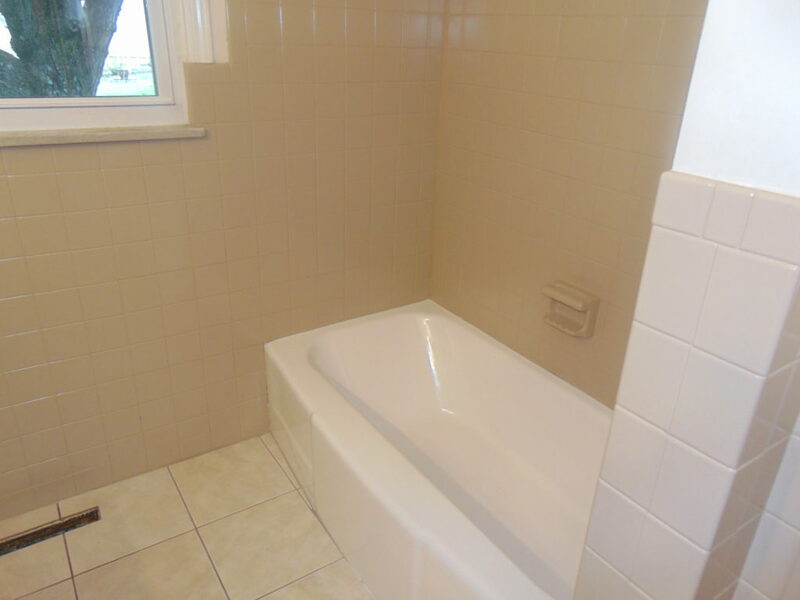 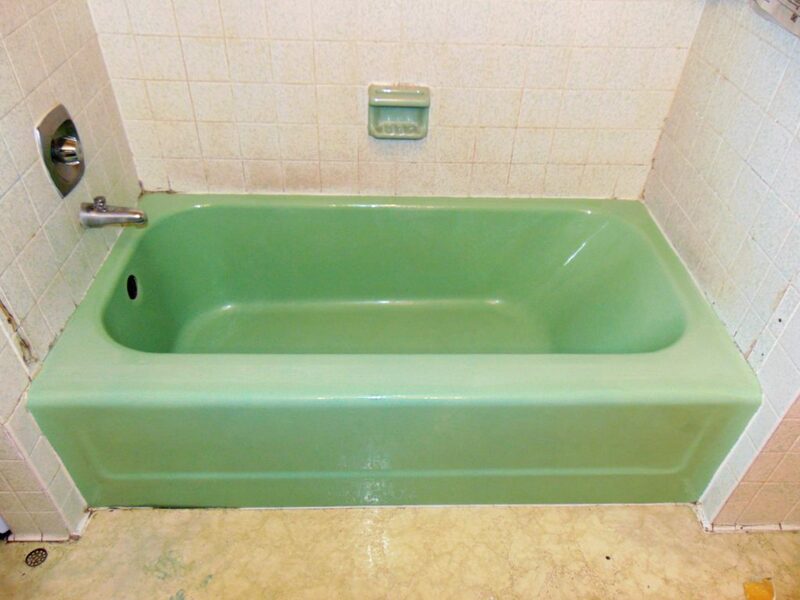 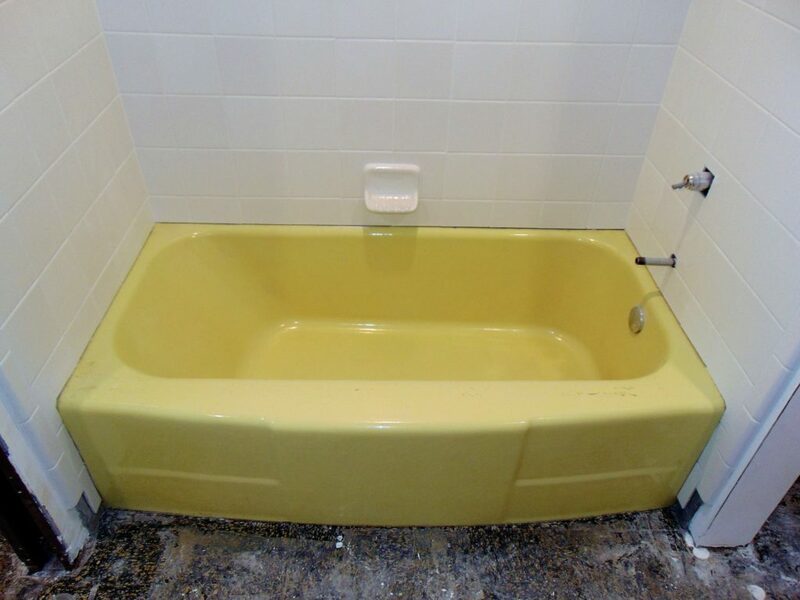 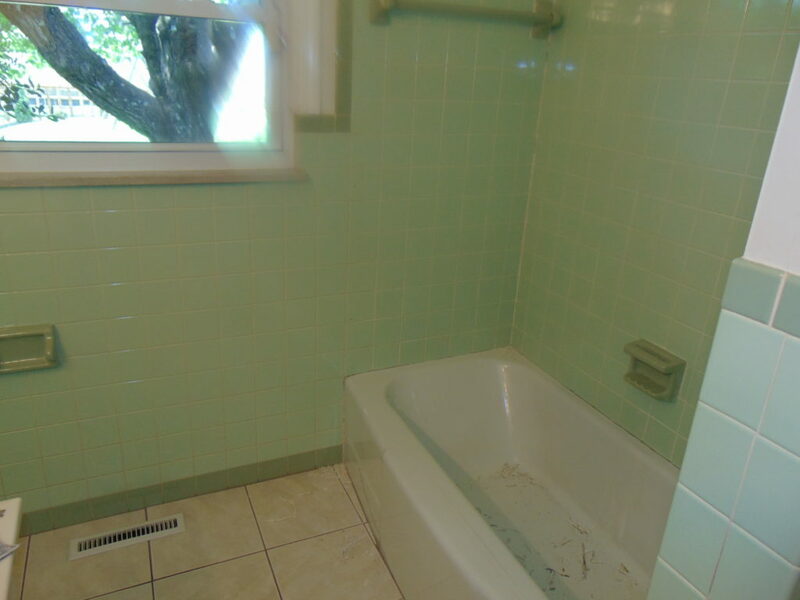 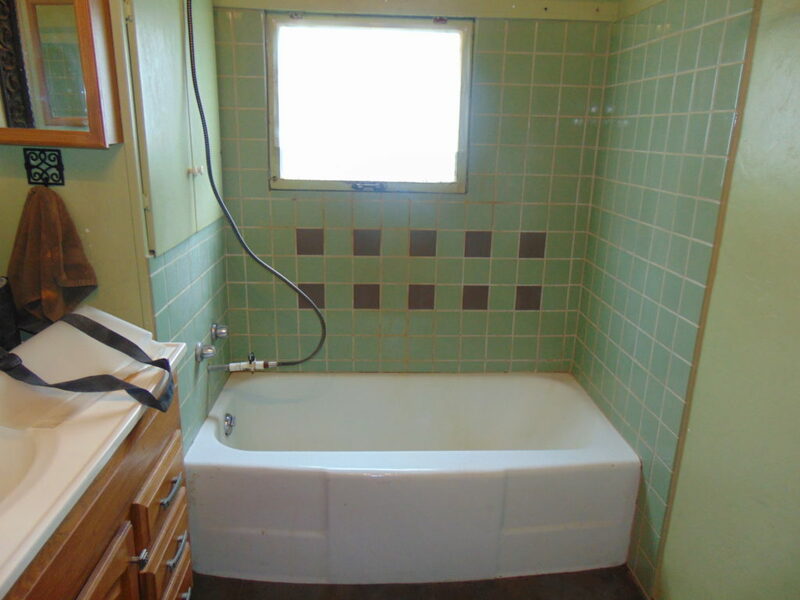 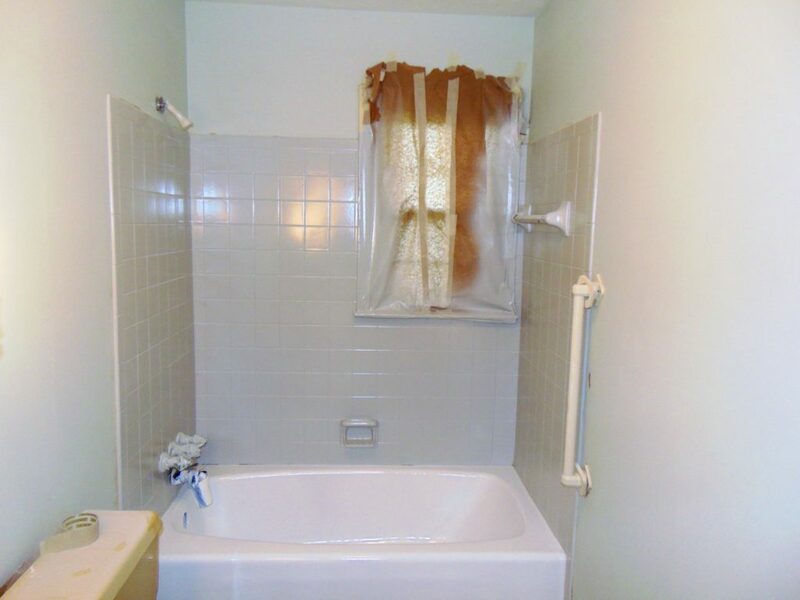 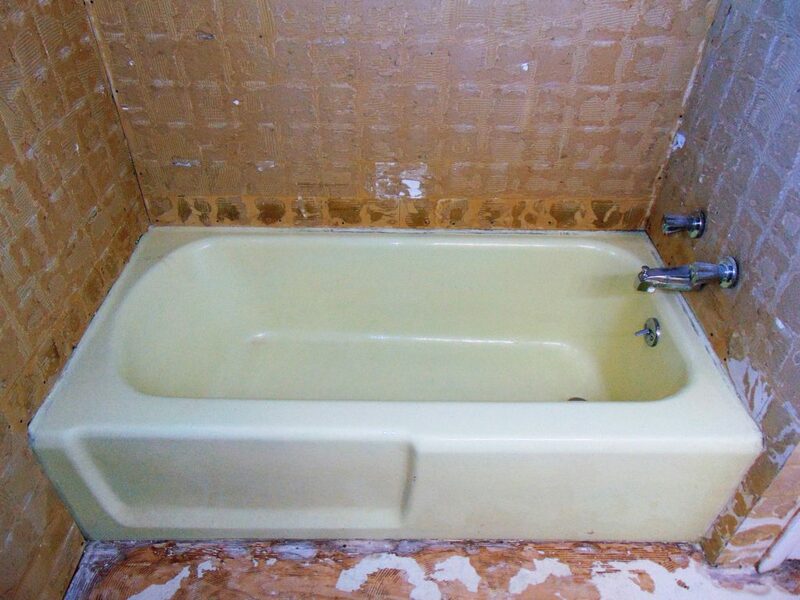 The bathtub was once refinished by another refinishing company and began peeling around the drain area. 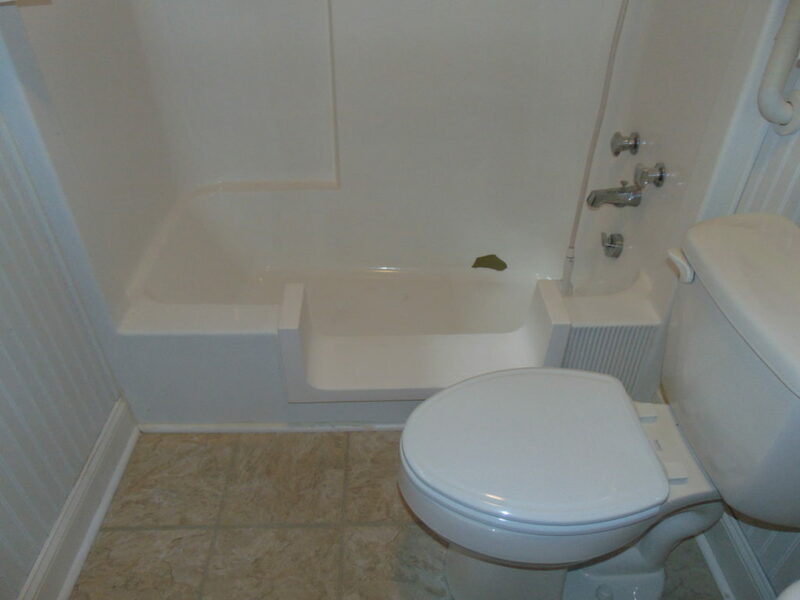 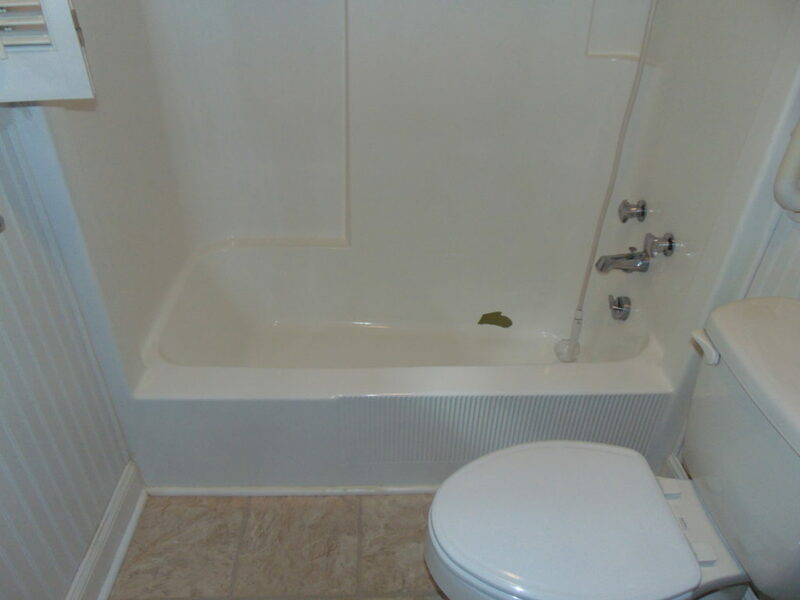 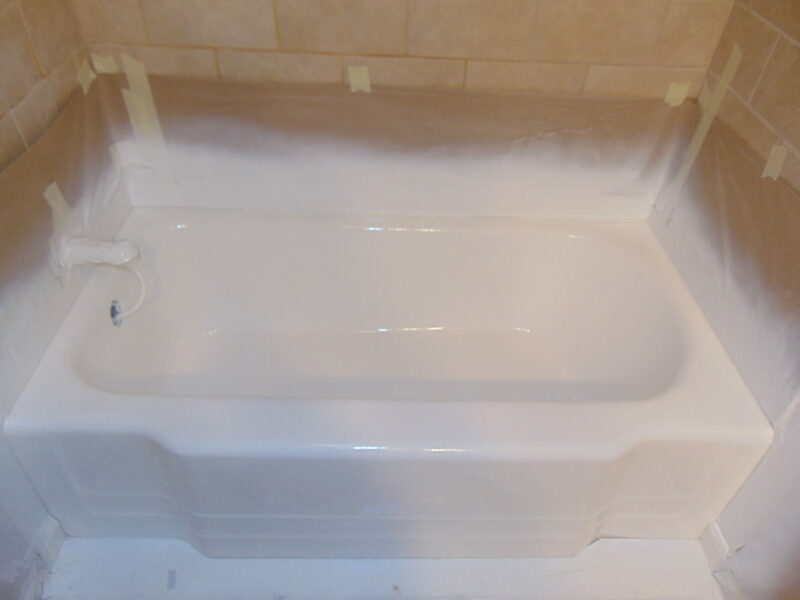 We spot repaired the damaged area saving the client even more money by not having to refinish the entire tub. 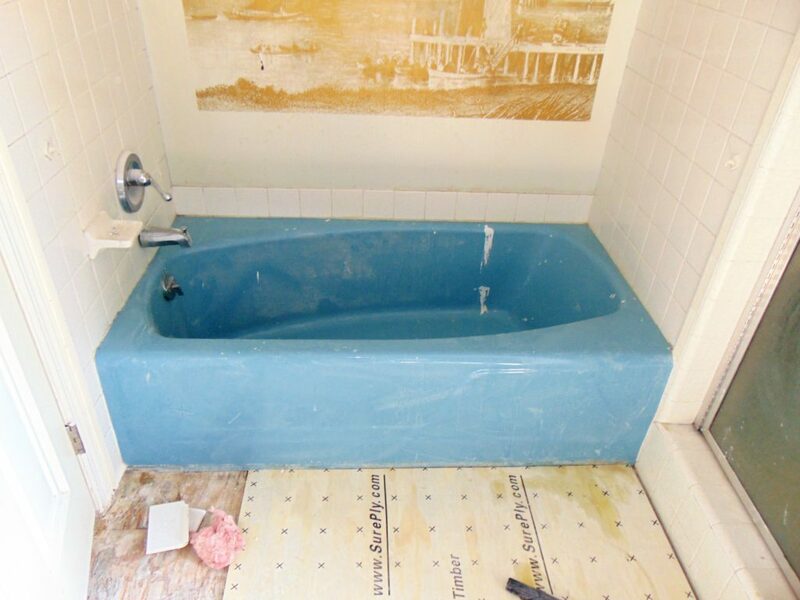 This is just a little insight of our Miraculous process of restoring your bathtub and protecting your walls, flooring and other items. 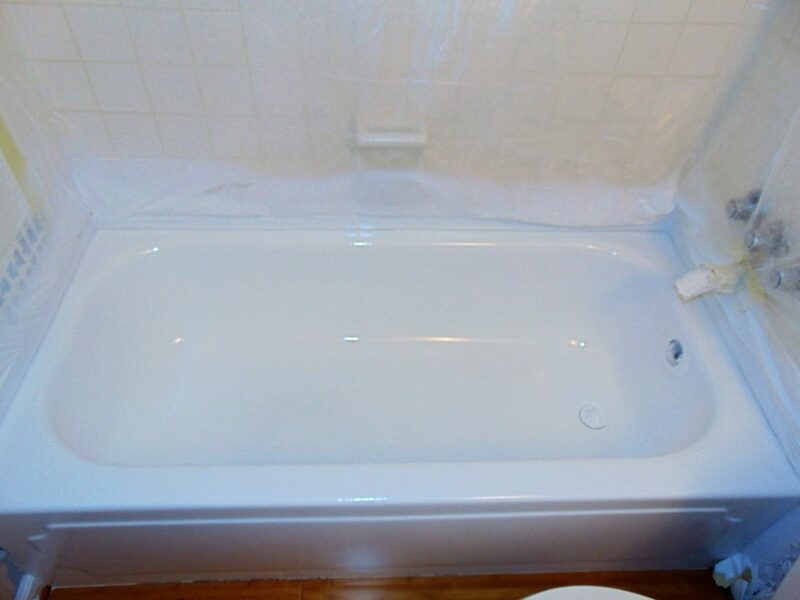 This happy client in Church Hill, TN will enjoy nice hot bubble baths for many years to come! 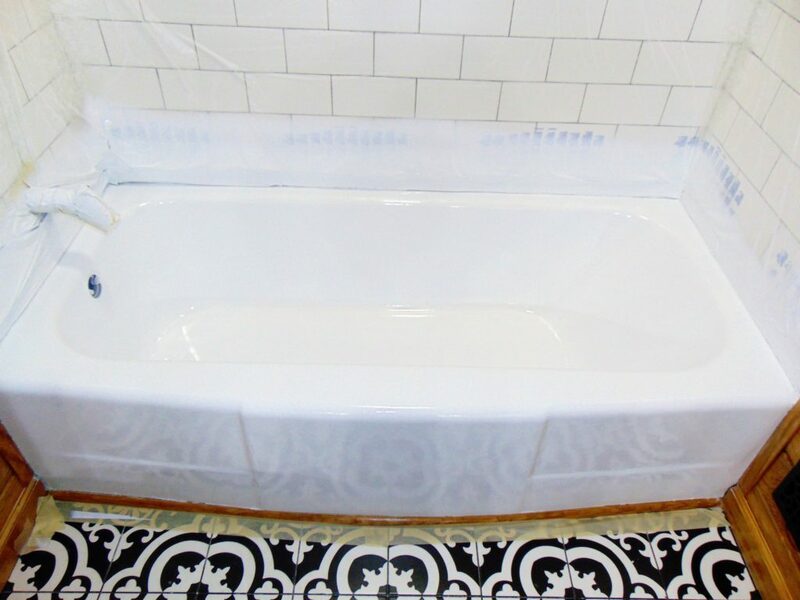 Our safeway step bathtub cut out conversion allows you to easily turn your existing tub into a walk-in shower. 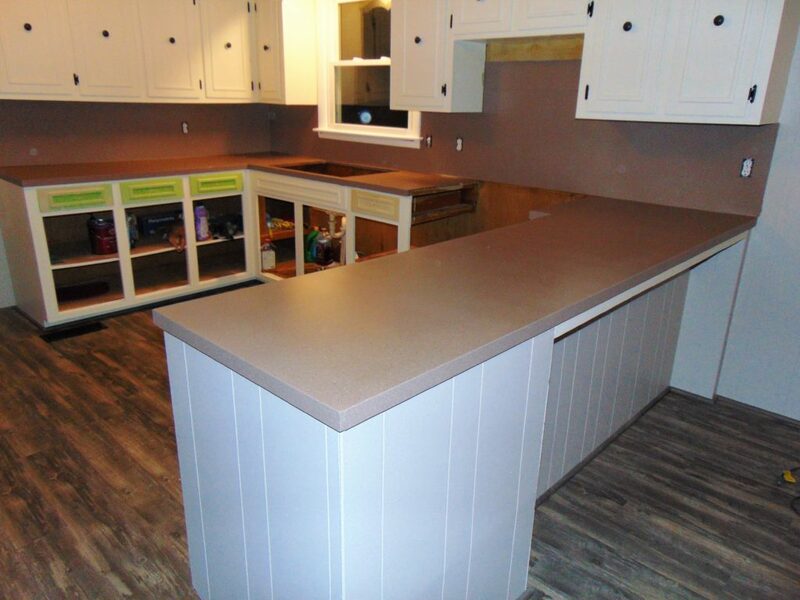 Its designed to fit your budget without spending thousands on a traditional remodel. 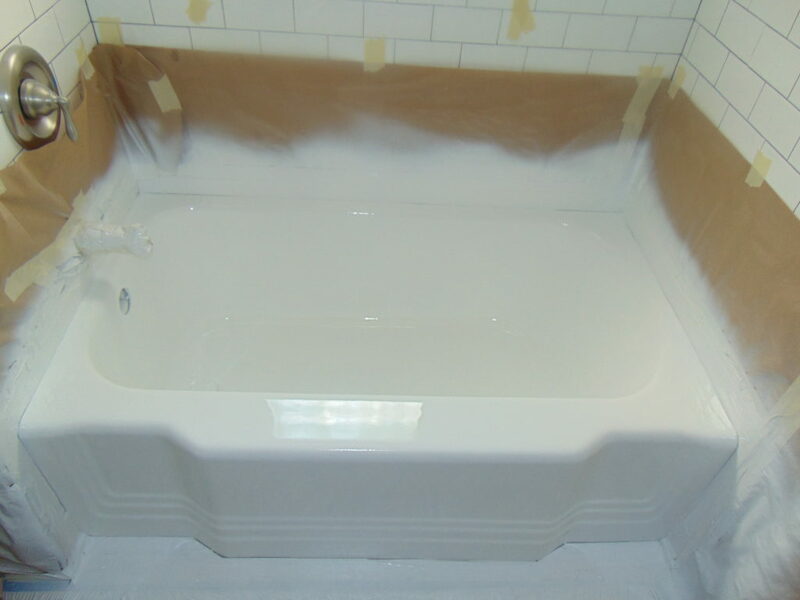 There is no need to replace or refinish your entire bathtub just because of chips and cracks. 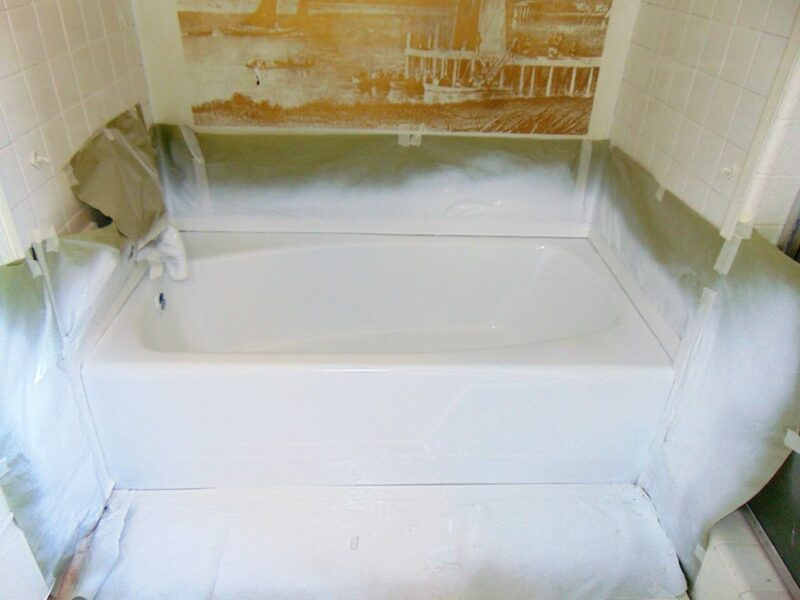 Miraculous Makeovers will spot repair the damaged area of your tub, then blend it to match the rest of your bathtub. 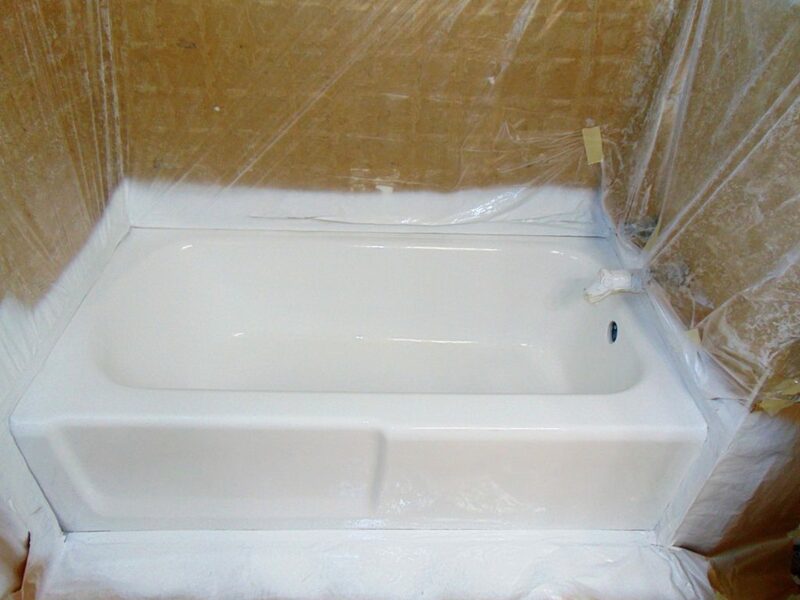 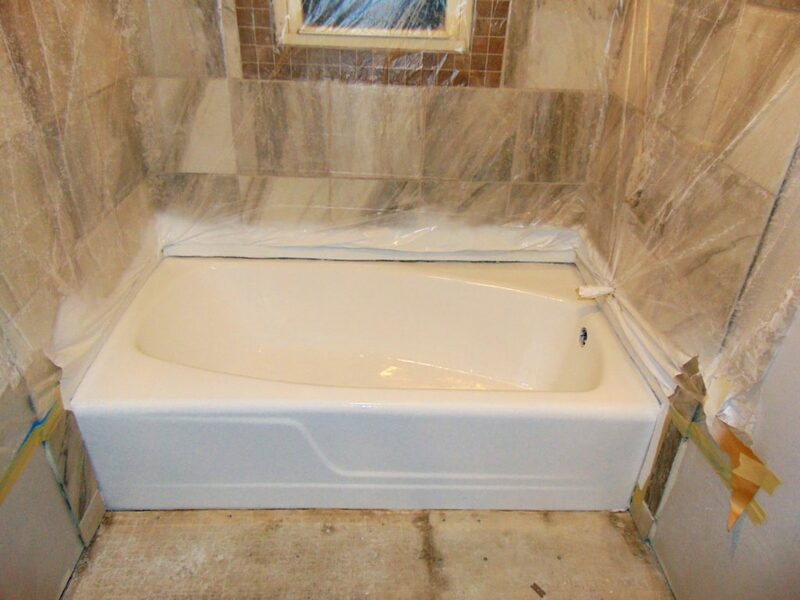 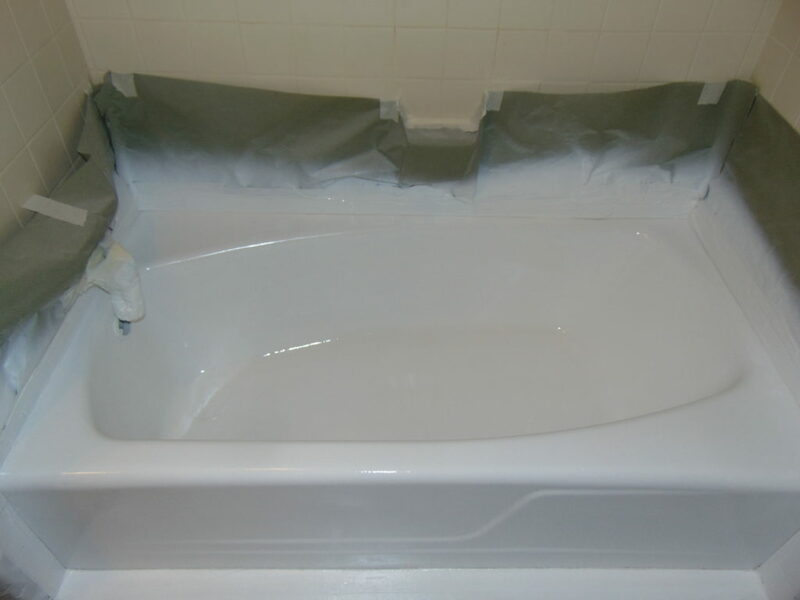 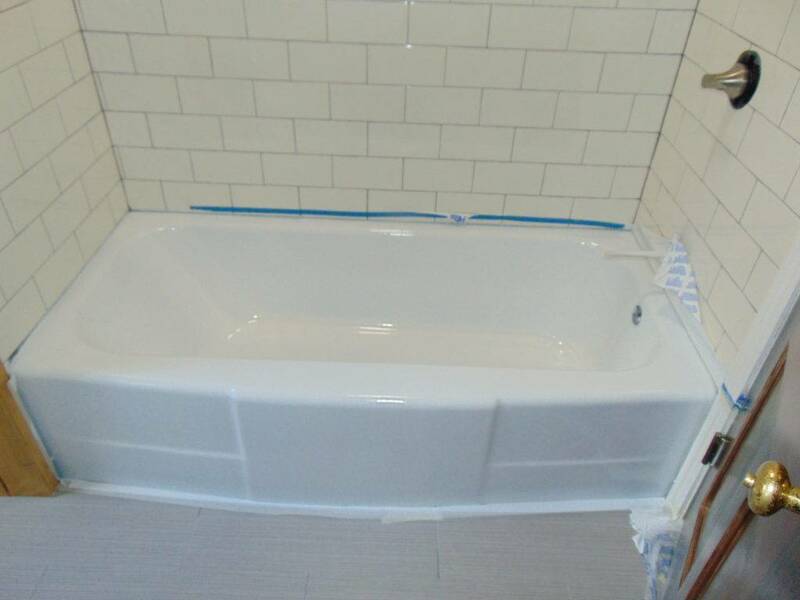 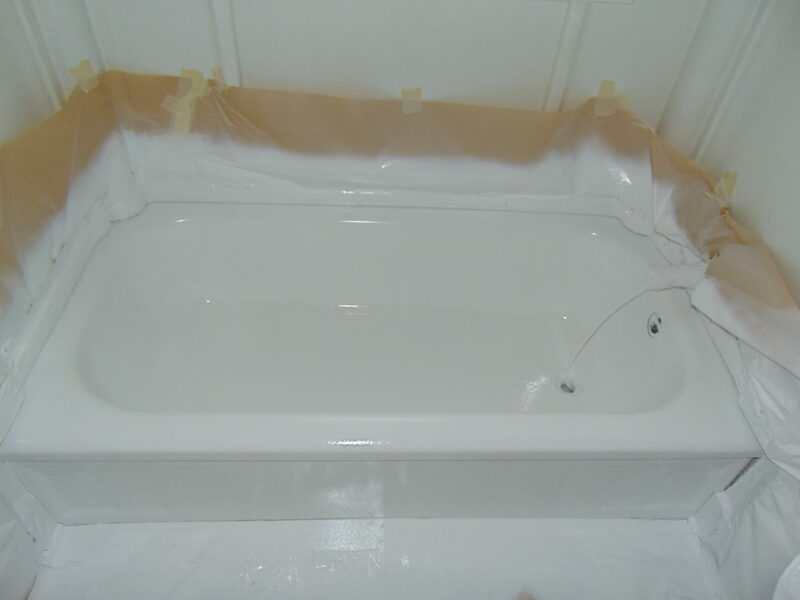 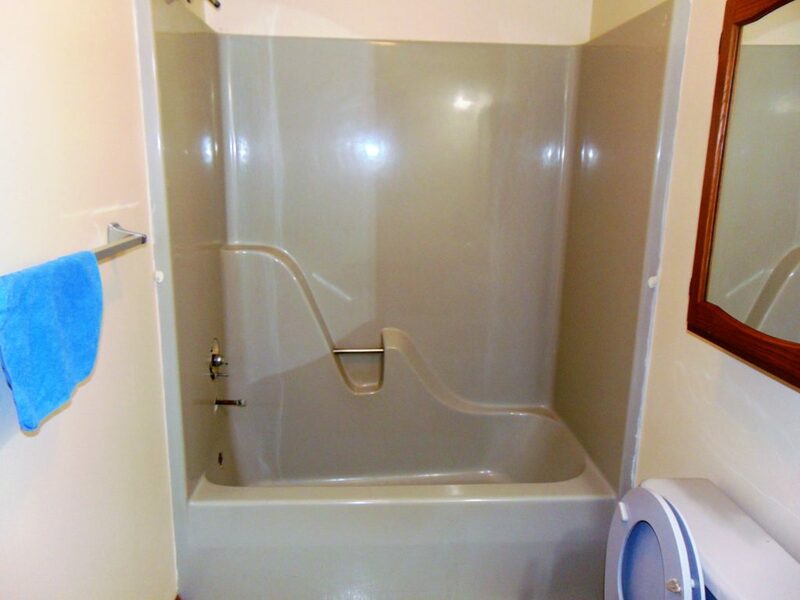 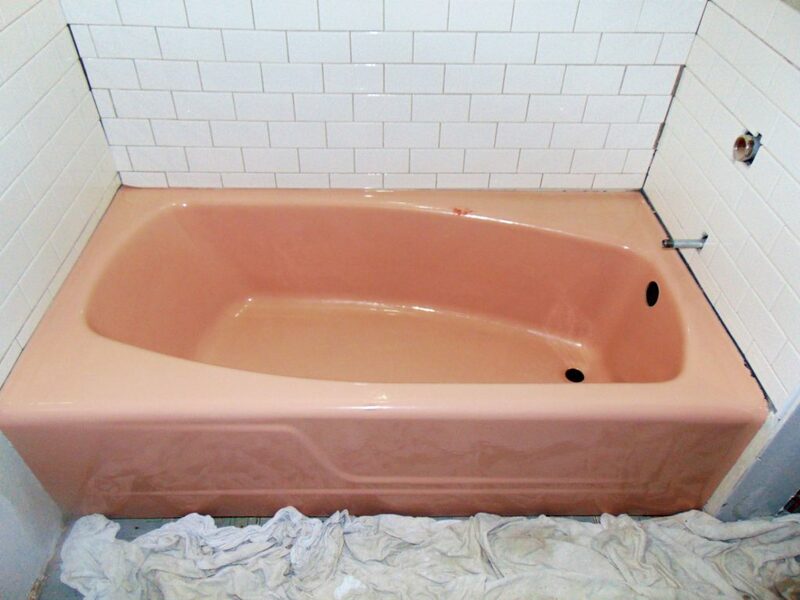 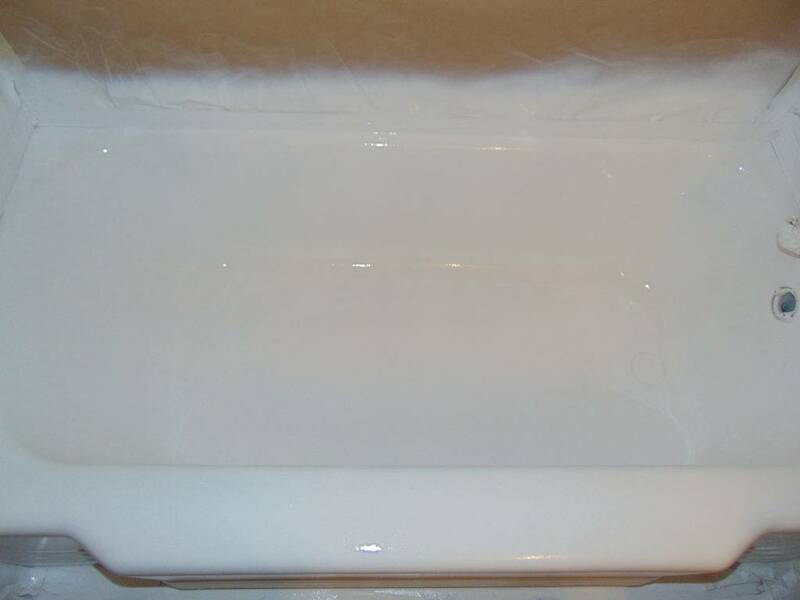 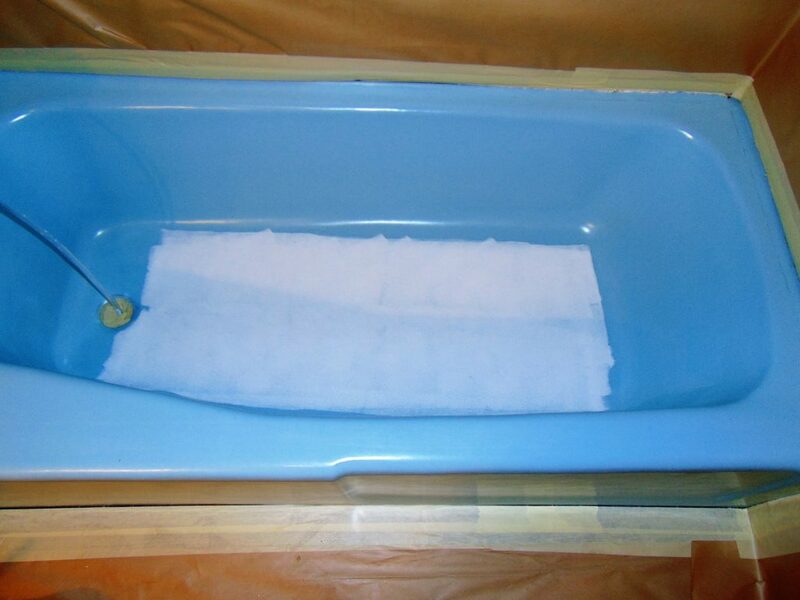 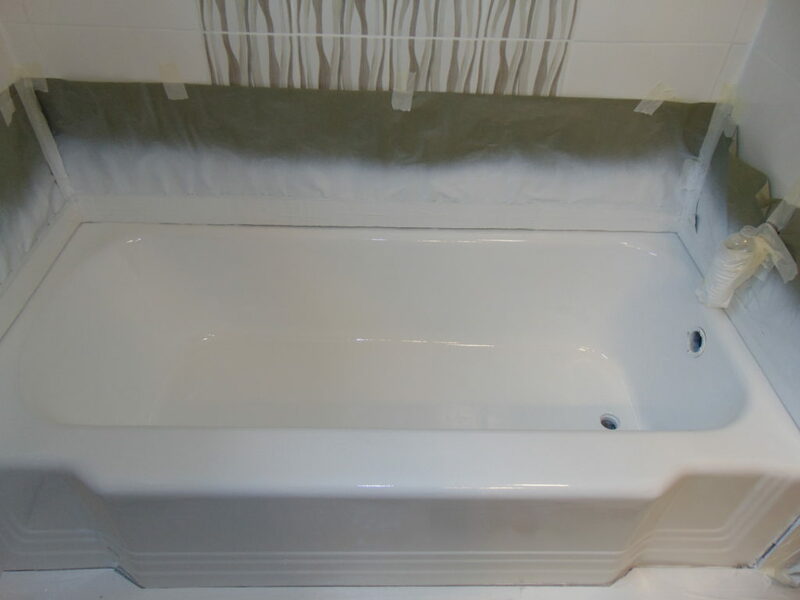 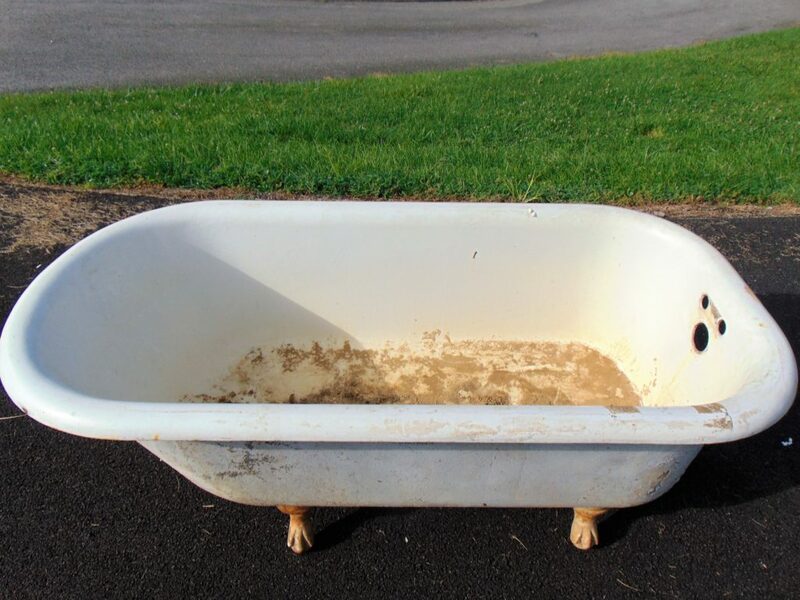 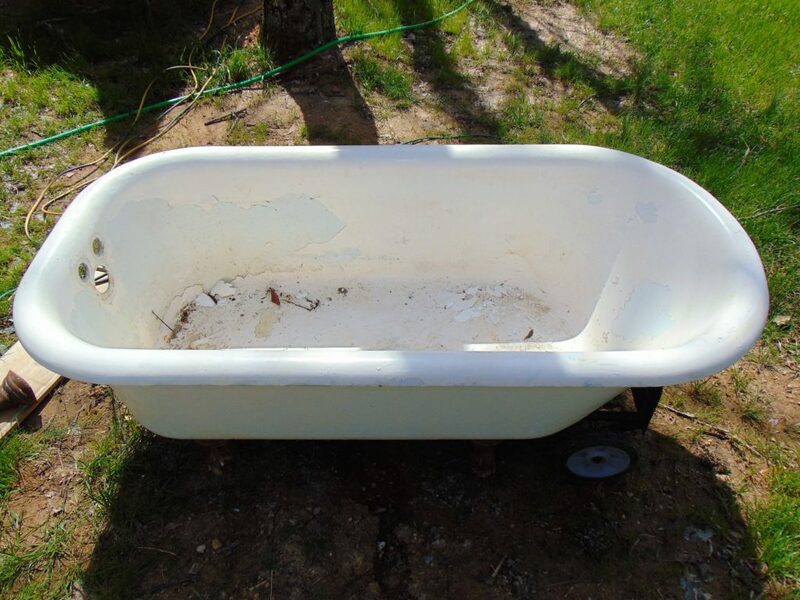 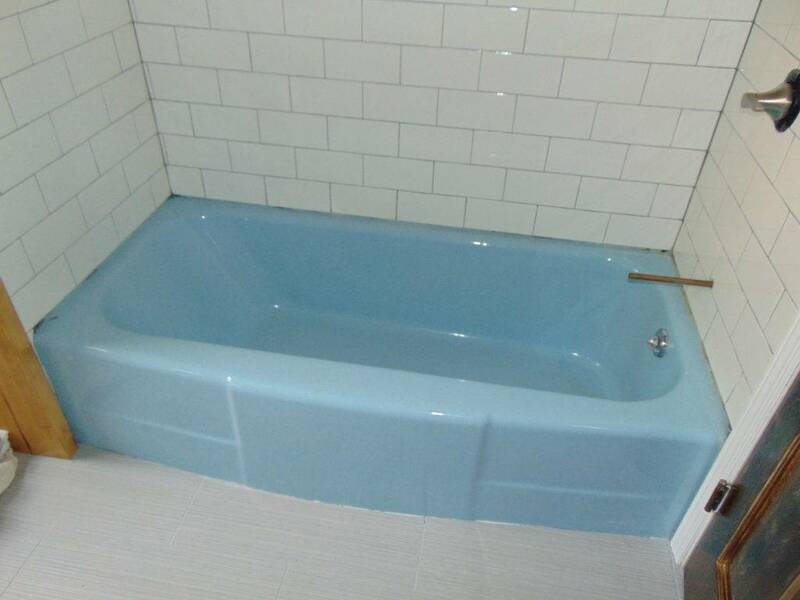 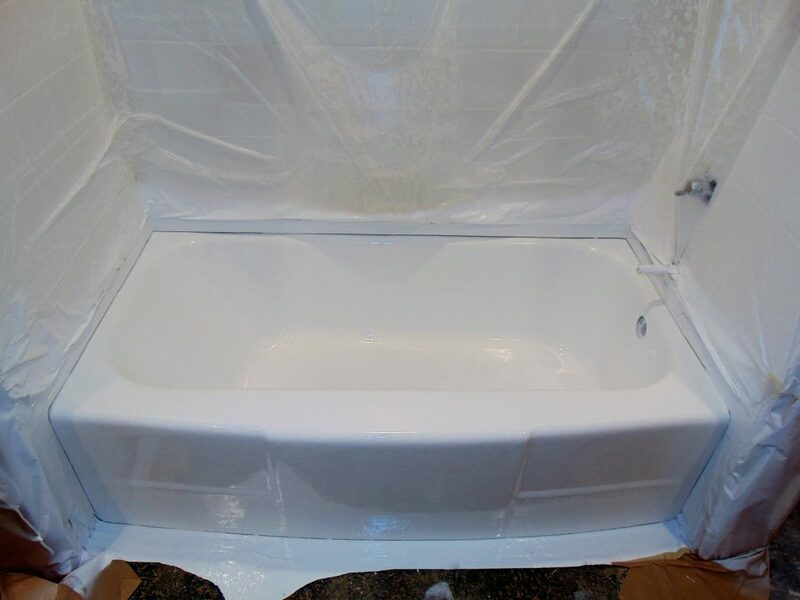 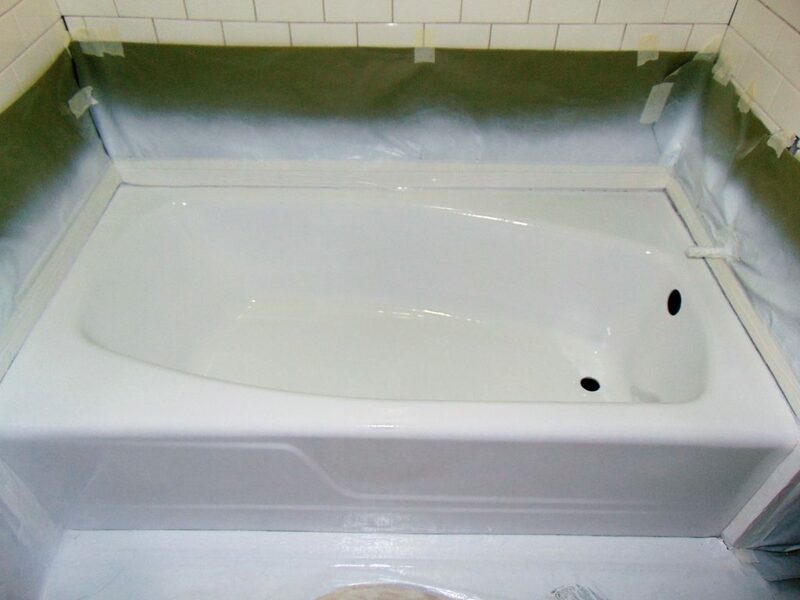 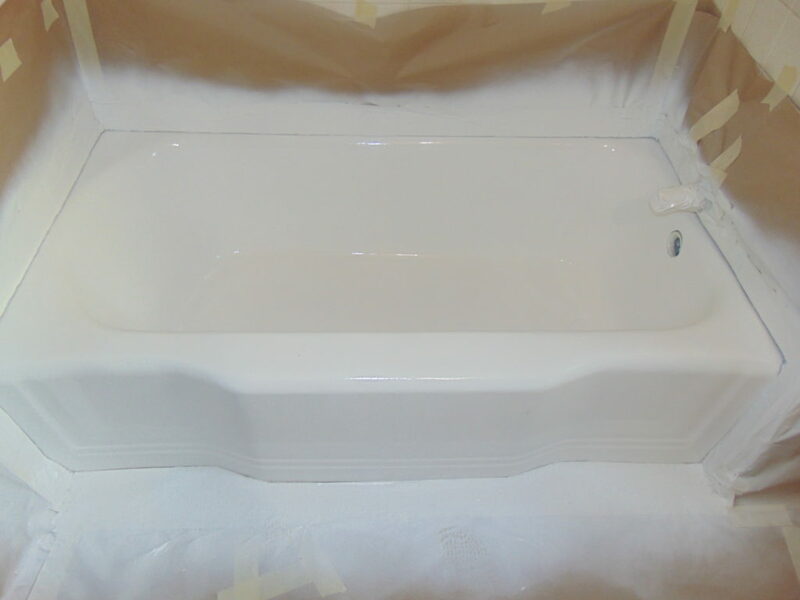 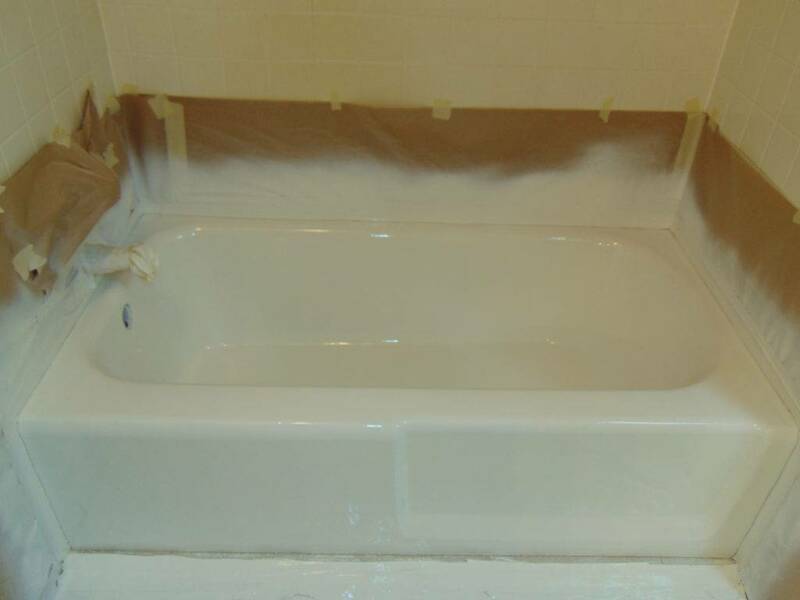 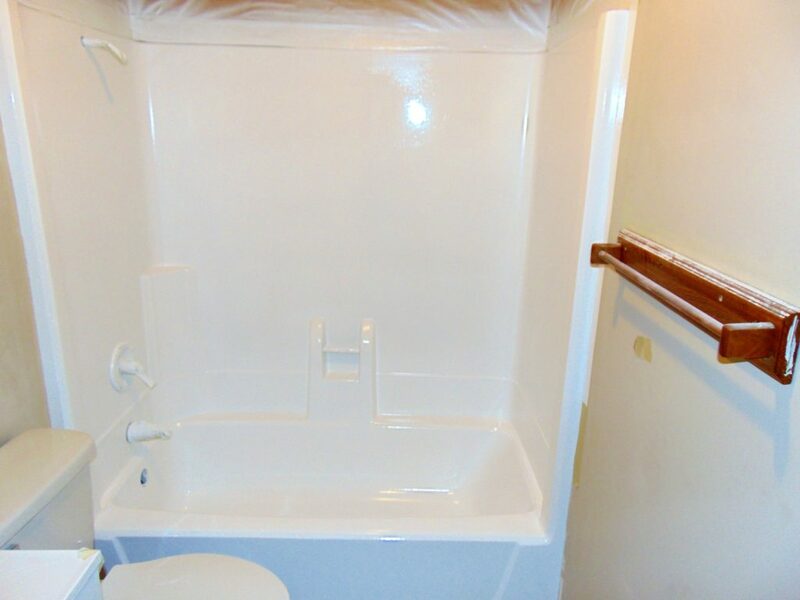 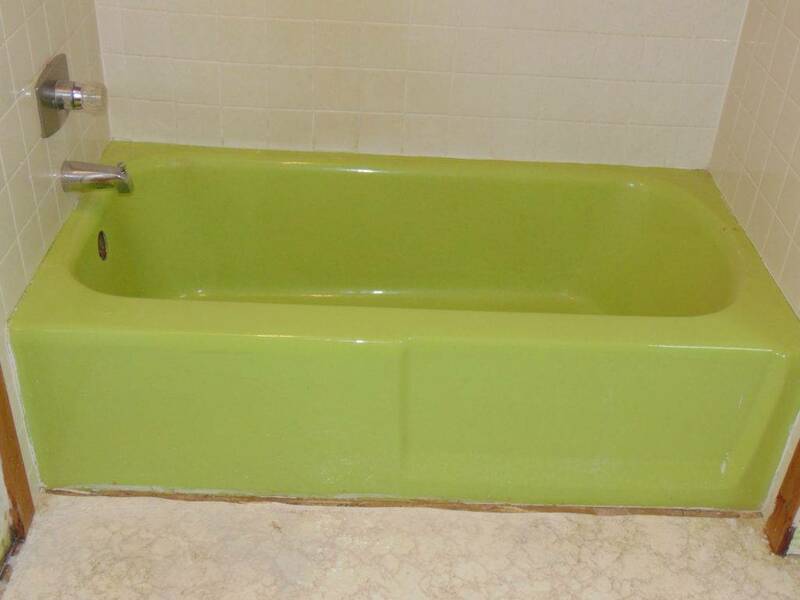 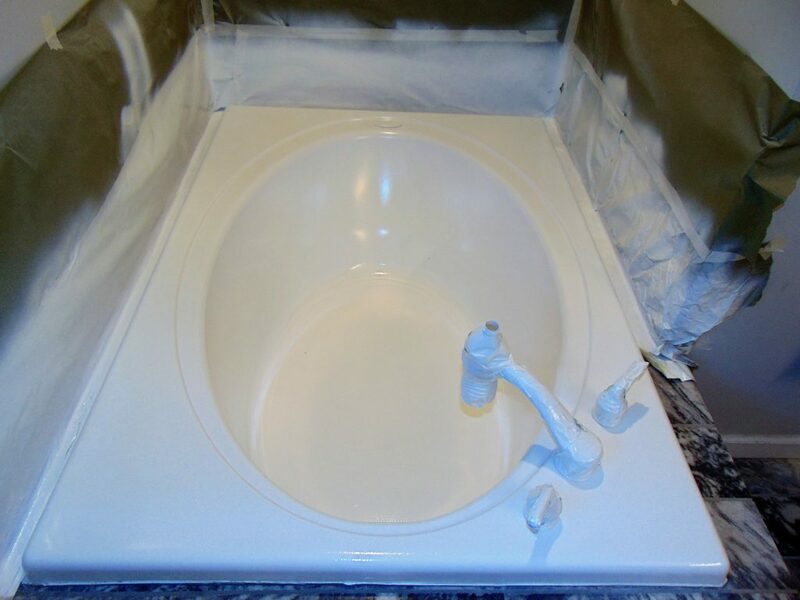 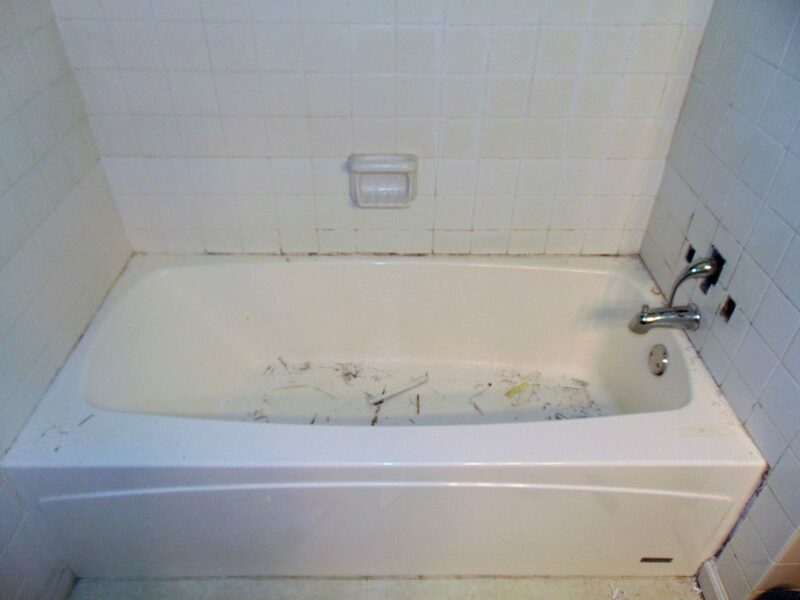 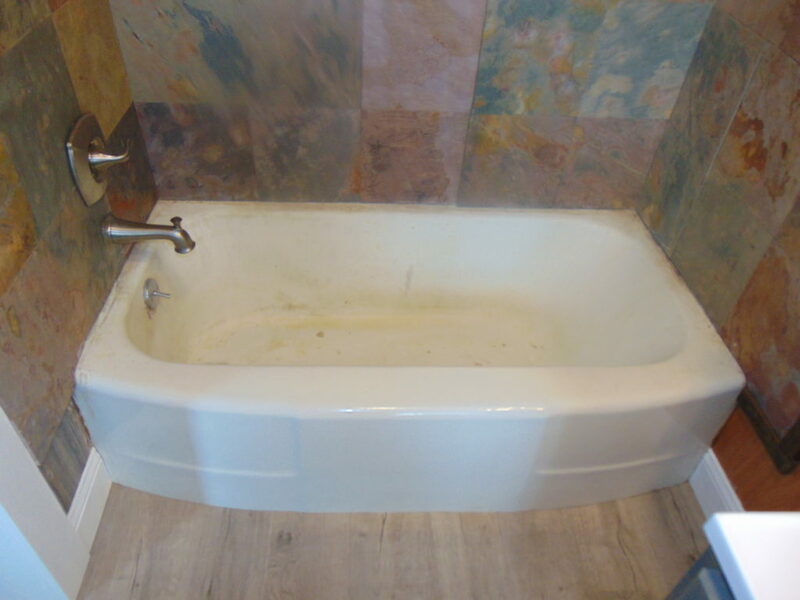 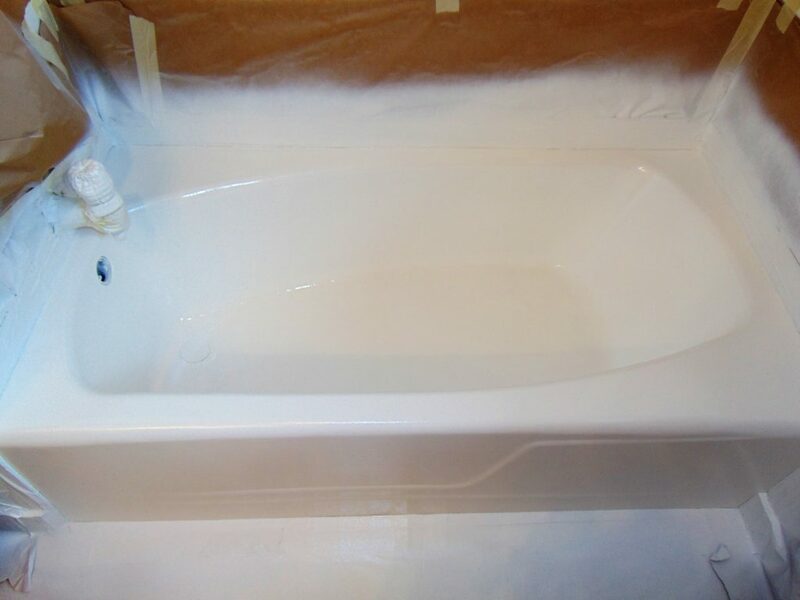 Our fiberglass bathtub repair service will make it look like it has never been touched. 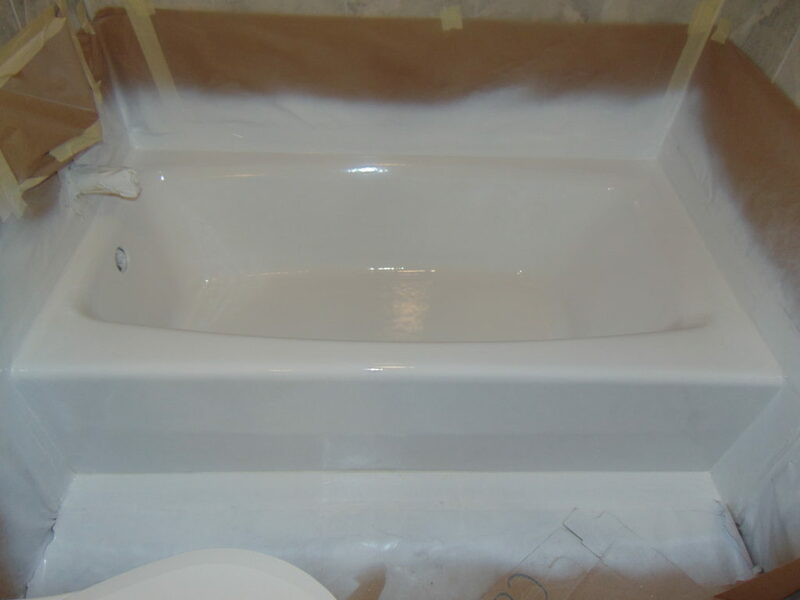 When you need your bathtub refinished we highly recommend this service because we care about your safety. 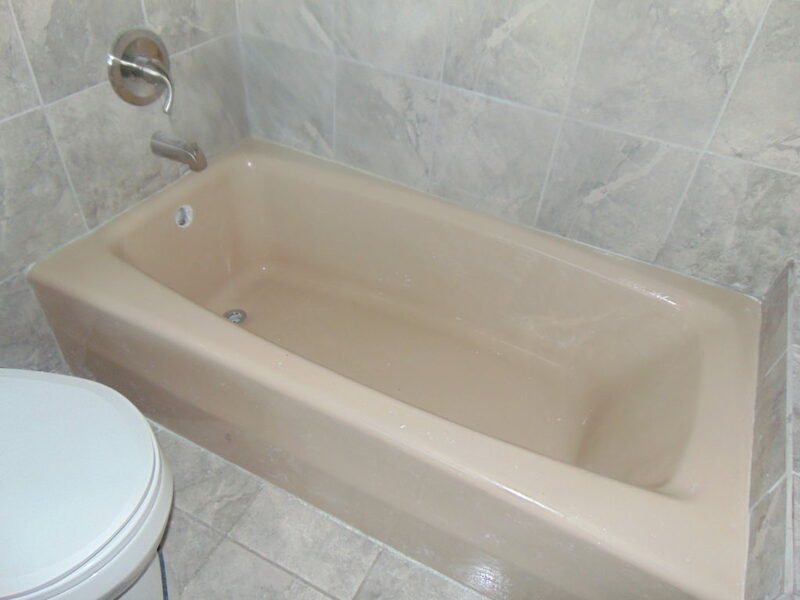 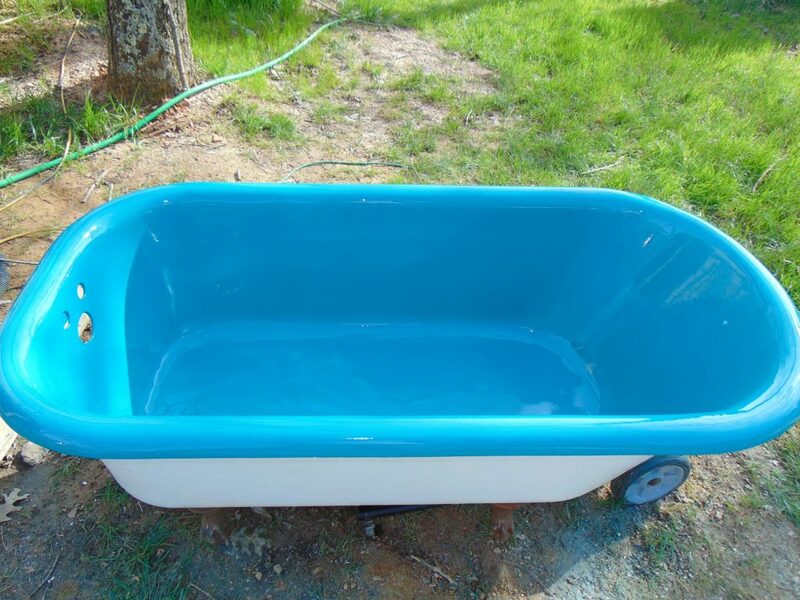 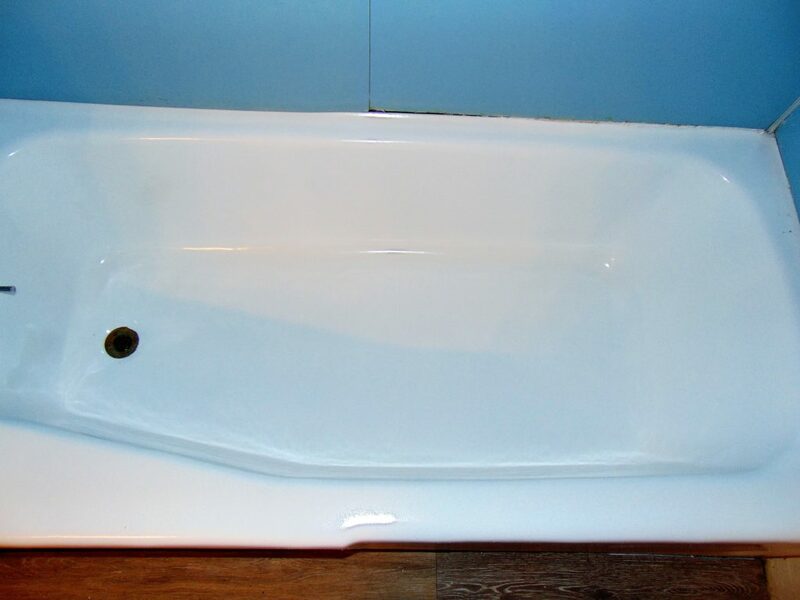 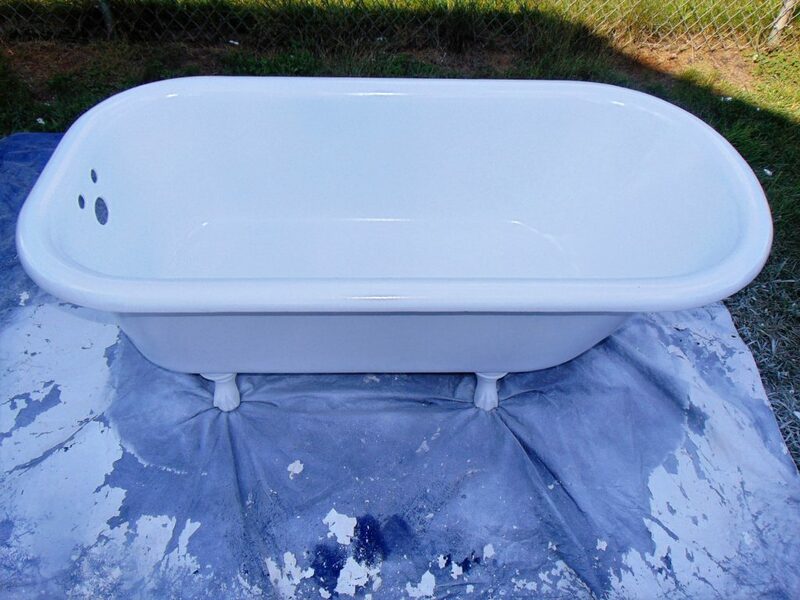 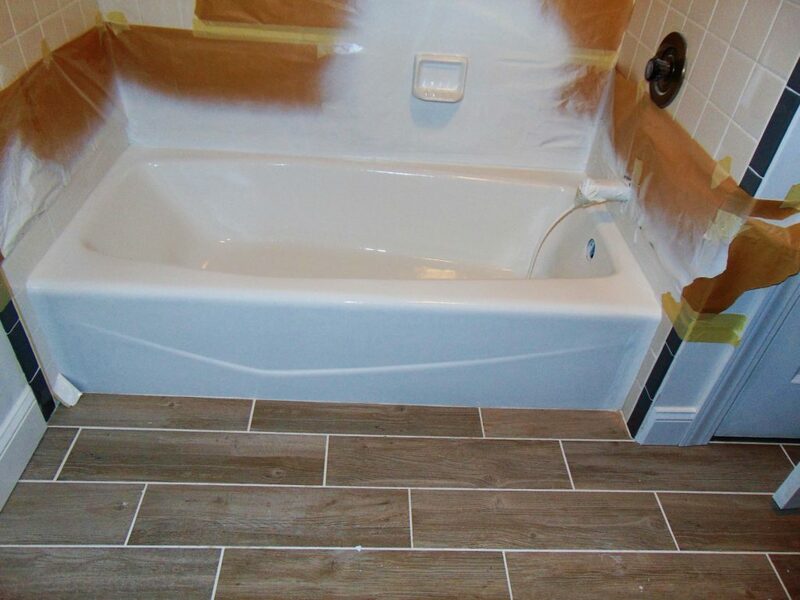 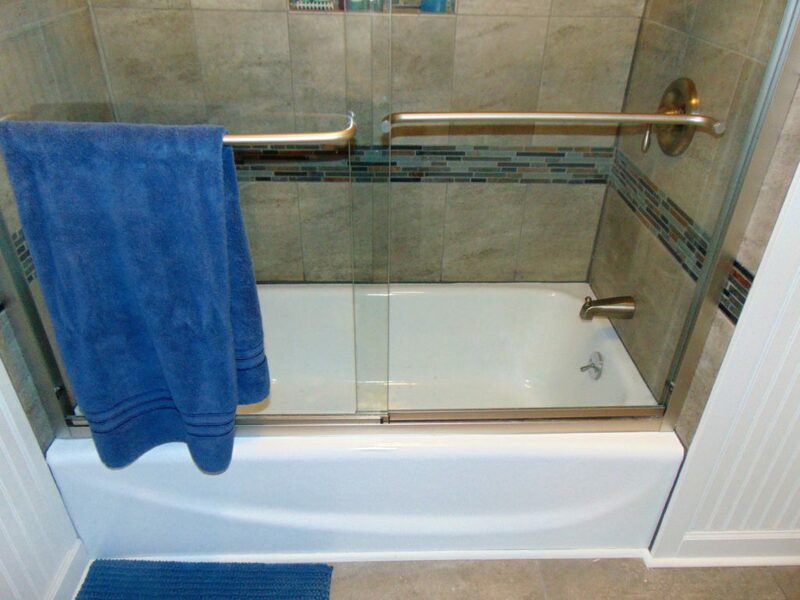 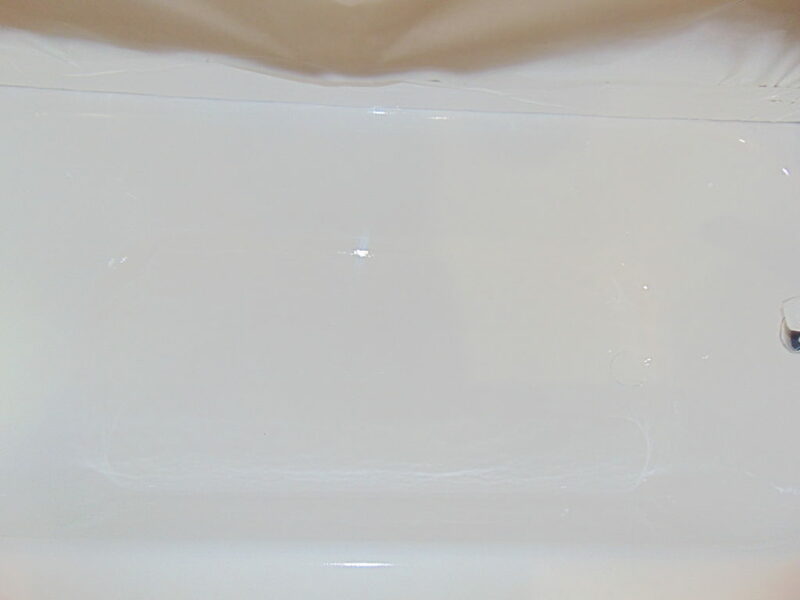 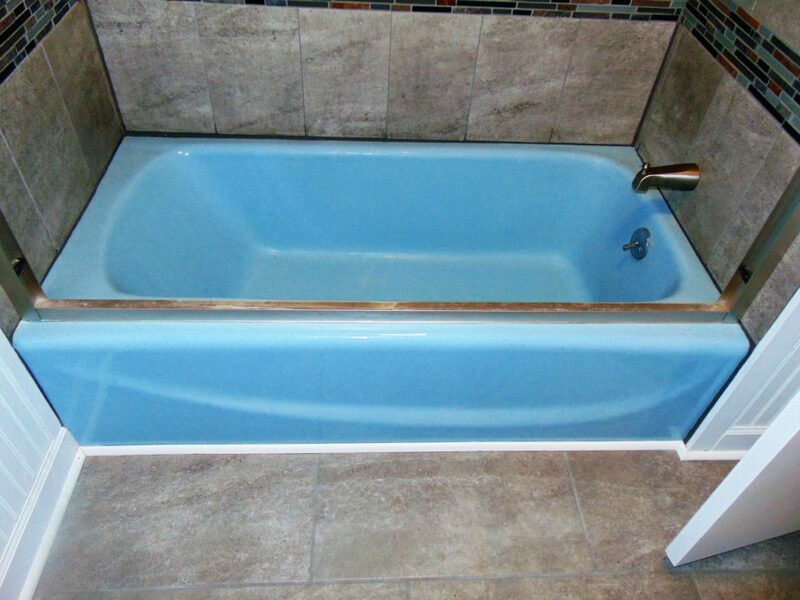 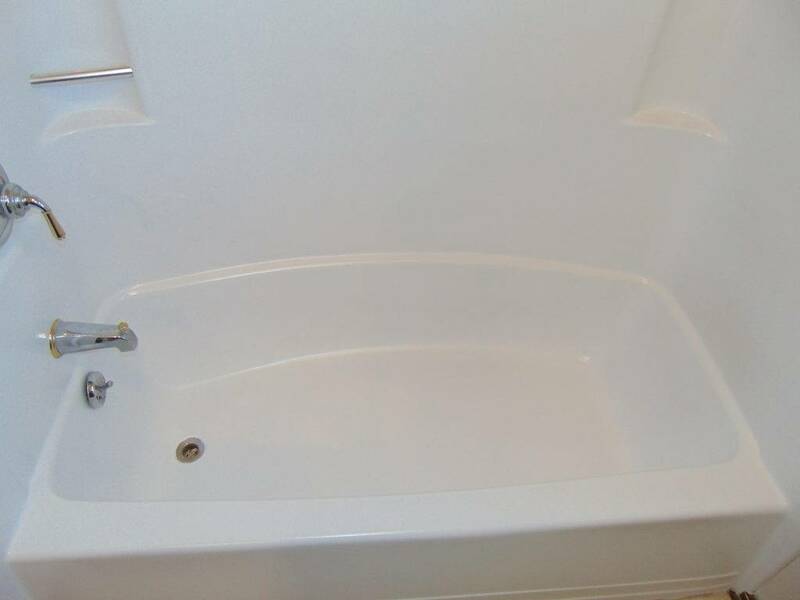 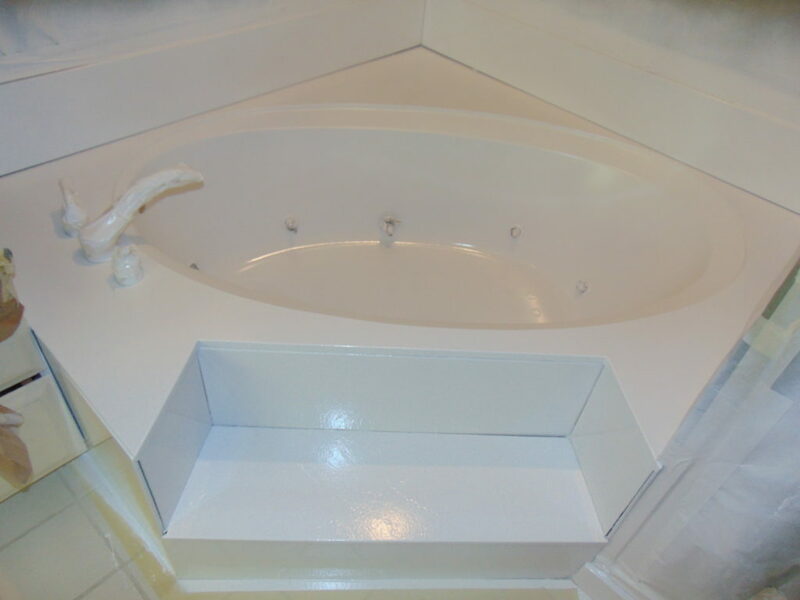 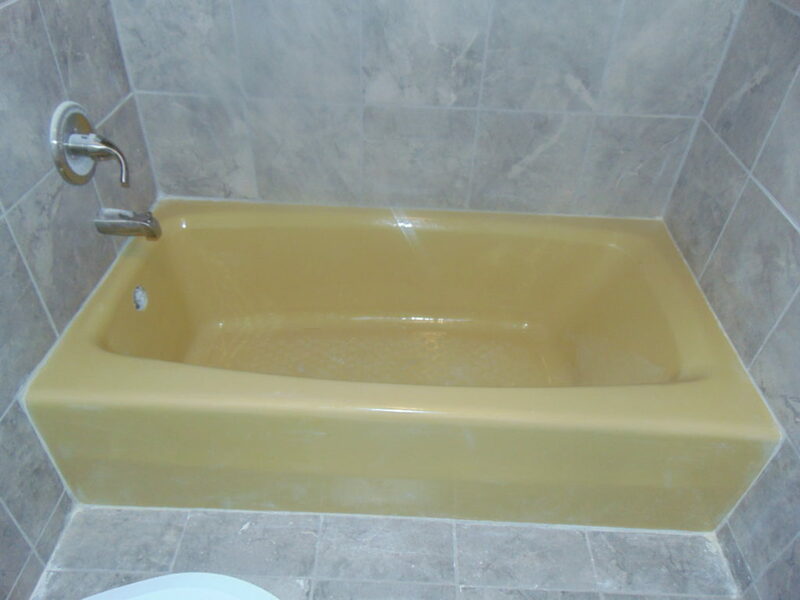 Having your tub refinished without the non-slip bottom makes your tub very slippery and unsafe. 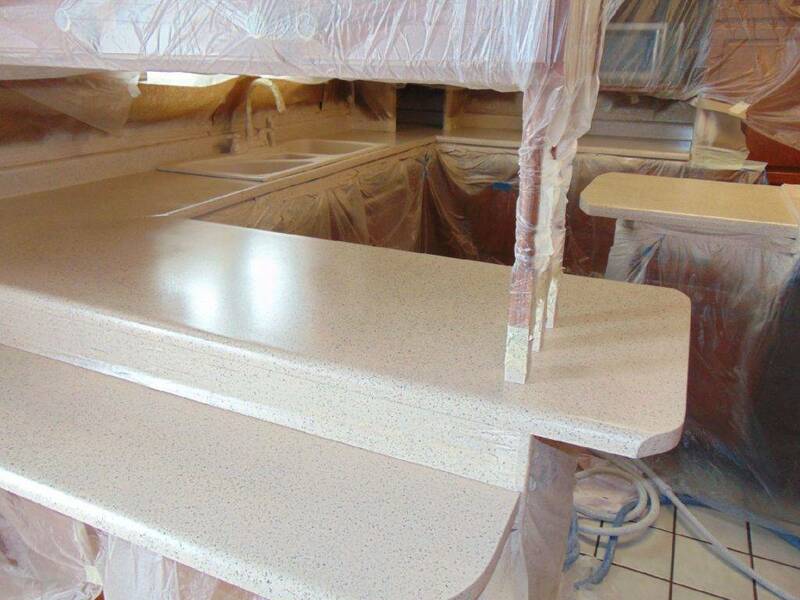 Ugly green to a beautiful down home brown base coat with terrain flecks and a durable satin top coat.